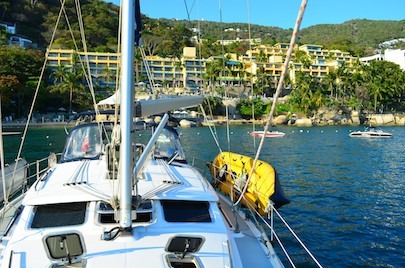 Life on the Hook in Mexico – What do you do all day when you’re cruising in the tropics? Sailing off into the sunset is a dream a lot of people share, and some even get the crazy idea to go ahead and actually do it. What’s it like? 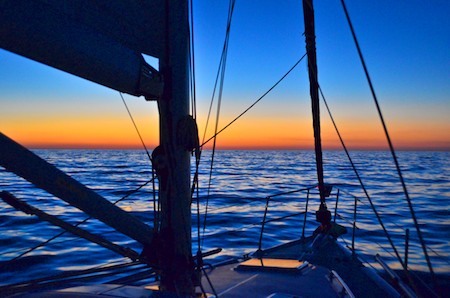 Here’s a glimpse of some of the things we do each day in our cruising lifestyle — kind of a behind-the-scenes look at our life of leisure aboard a sailboat in the tropics. We have fun above and below water. When we decided to cruise Mexico, we planned to anchor out pretty much 100% of the time. That way we could put more of our budget into a comfortable, newer boat, while keeping the day-to-day expenses to a minimum. 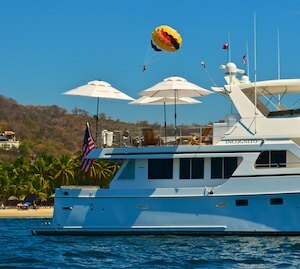 Marinas in Pacific Mexico typically cost anywhere from $30-$50 a night or $600-$900 a month for a boat our size, so living “on the hook” at anchor can mean big savings. But living on the hook has its ups and downs. Literally!! The Pacific swell keeps the boat in constant motion, frequently lurching it from side to side for hours, or even days, on end. Also, the beautiful ocean is often held hostage by red tide — or algae blooms — that cloak it in an unpleasant color and odor, and fill it with debris, making swimming impossible and dropping the water temps as much as 10-15 degrees Fahrenheit. 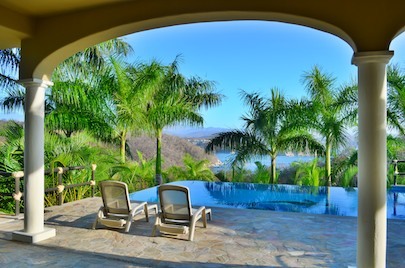 For the past week, however, we have had one ideal day after another (November, 2012, in Huatulco). The water has been turquoise and clear and in the high 80’s. The air has been sunny and warm, and the swell has been modest, jolting us awake with a jerk only once or twice a night, if at all. Our days have been spent swimming til our skin is wrinkled, kayaking in the bay, and walking the beach where the waves caress our feet with the warmest of sun-heated ripples. Life on the hook, even during these heavenly days, is not exclusively about umbrella drinks in the cockpit, however. Each day we have a few hours of work that needs to be done. Mark keeps us on track with this stuff, making lists and making sure we stick to them. I always find my interest in these things wandering quite a bit, though. Left to my own devices, I’m afraid the list would soon be lost, and after a few weeks we’d be living in true squalor. Who wants to quit swimming to do a bunch of boat chores?? 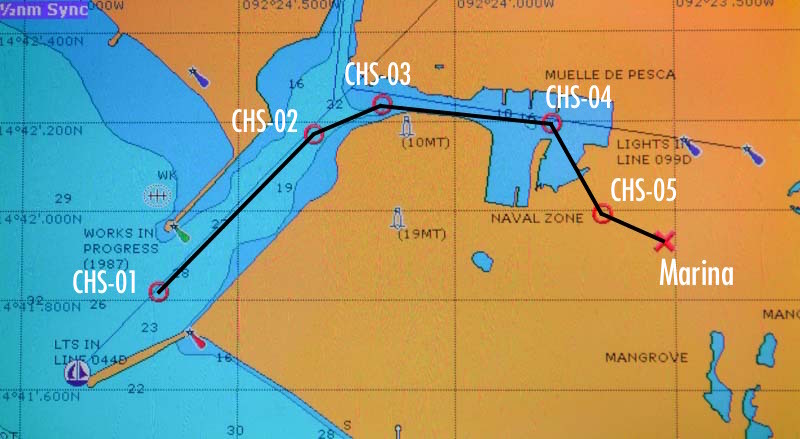 Since I’ve worked with computers all my life and had cruised before, the chartplotter was easy for me to learn, and I became navigator and skipper while underway. In our RVing life I never tow the trailer and rarely drive the truck. Last time I tried parking the rig, I put us exactly perpendicular to the spot I was aiming for. Mark’s last docking experience with the boat went just about as well. So this division of labor has been a happy one. I love technical things and understand the theory of many things on the boat, and I got a huge kick out of researching and specifying the boat’s major system upgrades. But when it comes to holding a wrench I am still flustered by which end is which. Mark was a professional service engineer for Xerox’s high speed (room sized) printers and grew up working on cars. He is a master when it comes to electro-mechanical troubleshooting and installation. 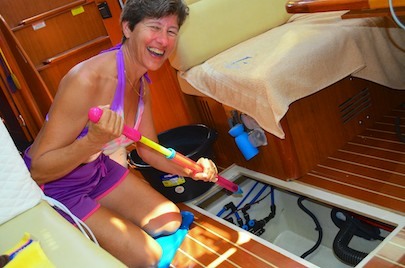 I like using a kid’s bazooka water gun to clean the bilge! So, in exchange for putting all the responsibility for all the boat’s systems squarely in his lap, I volunteered to keep the bilge clean. Having a clean bilge makes it is easier to notice when something isn’t right. Water in the bilge must be coming from somewhere. Is it salt water or fresh water? Guess who gets to find out! Hopefully if a chemical is leaking into the bilge it isn’t lethal!! 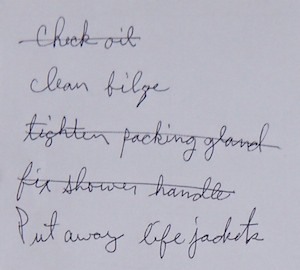 In our earliest days in Huatulco, “clean bilge” went on the to-do list (our engine’s packing gland material is getting old, so it drips now). 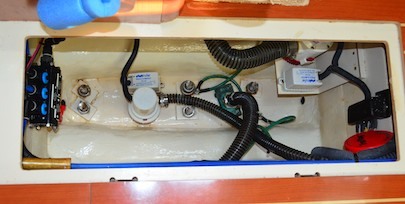 Mark had the luxury of taking a snooze next to the open bilge compartment when he finished his items on the To Do list! I dawdled as long as I could. Boat work done? Take a snooze! I’ve found the easiest way to get water out of the bilge is to use a kid’s bazooka water gun. Ours has a pointy end that can get into the crevices, and it soaks up a good bit of water that can then be squirted in a pail. Doing a final squeegee pull with fresh water before putting the toy away has kept it in good working order. There, it’s done, and we have a clean bilge once again. Living on the hook means that going ashore requires either a swim or a boat ride. So taking out the trash requires loading it in the dinghy first, and then finding a trash barrel on shore somewhere to throw it away. The kayak works for this task too. 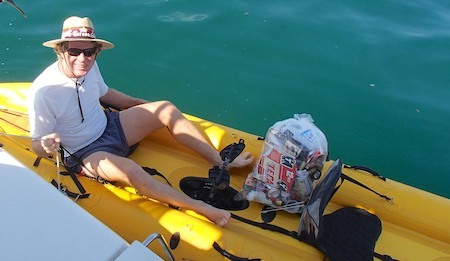 The cool thing is that after the trash is gone you’re free to go exploring either on foot ashore or in the kayak. Getting the laundry done also means loading it up in the dinghy and then lugging it to a laundromat — that is, if there is a laundromat somewhere nearby! In most Mexican ports laundry service isn’t hard to find. Everyday we wash yesterday’s clothes in the sink. We wear light clothing around here and it’s an easy task. 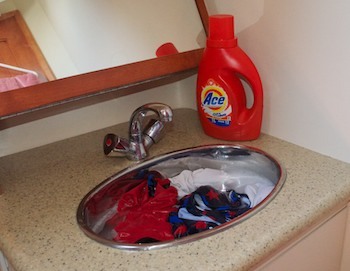 So, to avoid the laundry hassle while living on the hook, we’ve found it’s easiest just to wash out yesterday’s clothes in the sink each morning and hang ’em out to dry. Luckily our clothes down here consist of bathing suits, running shorts and light shirts. We haven’t worn shoes and socks since we got here. We both keep the bottom of the hull as clean as possible. In some places (like Zihuatanejo), the barnacles grow so fast you have to scrape the bottom with scrapers every few days. 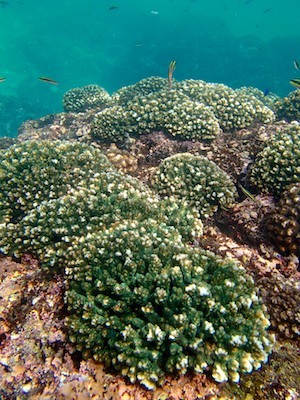 In other places (like the Sea of Cortez and Huatulco), you can merely wipe the bottom with a towel to get the algae slime off. It takes a lot of breath to get to the bottom of the keel, though, and Mark is much better at that than I am. So I do the hull and he gets the keel and scrapes the prop. Electrolysis in the water, especially at marinas, can eat a prop down to nothing in no time. So we put sacrificial “zincs” on the prop and shaft that are made of that softer metal. Screwdriver and zinc in hand, you gotta get down there and get it attached all in one breath. Over time, these zincs get eaten away by the electrolysis instead, sparing the prop shaft and blades’ slightly harder metal. Bountiful fresh water is critical to a comfortable life aboard, and we get our fresh water from a “watermaker” that converts ocean water into drinking water. This is a rather miraculous system, and our watermaker is enormous by cruising standards, converting 60 gallons of water an hour by pushing it through a strainer first (to remove the fish and sea creatures) then through two filters (to remove the algae) then through two 4′ long high pressure membranes (to remove the salt, bacteria and viruses). 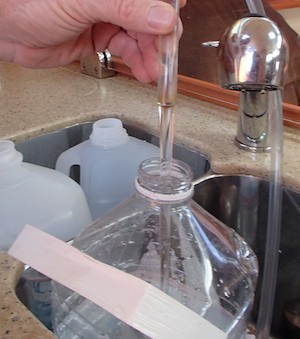 Wow – clean water!! Such a special treat. Red tide is an unfortunate fact of life on Mexico’s Pacific coast. The system is rated for 38 gallons an hour, but after the two membranes failed in our first season, the manufacturer (EchoTec) kindly replaced them with high capacity membranes, so now we fill a gallon jug in 63 seconds. It’s quite thrilling to watch. Shower water, toilet water and deck cleaning water all go into our holding tanks (140 gallons), but we keep our drinking water in gallon jugs as a habit held over from living in our trailer. Mark hated the watermaker the first year. It was a bear to install due to inaccurate manuals, incomplete parts shipped to us, and difficult positions for the various parts in the boat. Plus, installation required fabricating a bracket to hang the high pressure pump from the engine. To top it all off, the first membranes we received were dead on arrival. Then the replacement set failed after four months! Now, however, with great, working membranes, the watermaker is his pride and joy (“I want to keep it even if we sell the boat someday!” he joked recently). It is his favorite part of the boat. 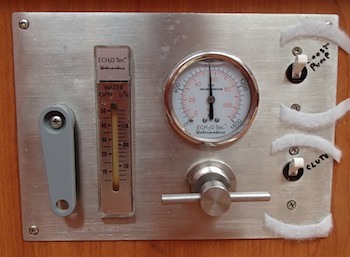 EchoTec’s main watermaker panel. 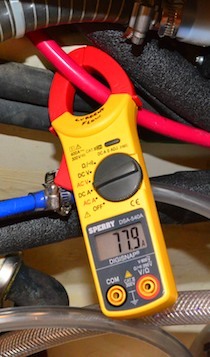 At 800 psi the system pegs at 60 gph. The purity of the water is measured by a TDS meter (“total dissolved solids”), and we found the San Diego water supply at our son’s apartment got readings of 350, and the FDA limit is 500. 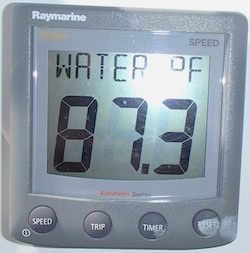 Our watermaker usually gives us readings between 75 and 95. Most boats our size have systems that convert 6-13 gallons an hour. However, we’ve found the 60-gallon-an-hour flow is fast enough to be able to wash the deck and cockpit with a hose run out a hatch. This is a real boon at the end of a salty crossing or after sitting in a dusty area for a while. So, making water and/or washing the cockpit/deck is often on our day’s to-do list. Then there’s food. We are simple eaters, so our diet is pretty plain by most standards. 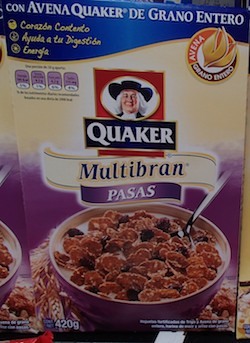 In Mexico we’ve discovered many familiar foods can be found on store shelves, even if the packaging is in Spanish. The most common bread available in Mexico is “Bimbo Bread,” which is equivalent to our Wonder Bread. But it turns out that Mexico’s Bimbo Bakeries actually owns the US brands Oroweat, Arnold, Thomas’s English Muffins and many others. We’ve found Oroweat breads in most supermarkets in Mexico, and the price of around $3 to $3.50 USD is comparable to home. It helps to learn some of the basic food terms in Spanish: “avena” (oatmeal), “integral” (whole wheat), “grano entero” (whole grain), “pasas” (raisins) and “azucar” (sugar) are a few. 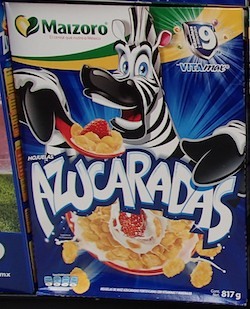 So when you see a cereal called “Azucaradas” with a crazy, wild zebra on it, you can tell it’s probably a sugar cereal for kids! In this age of jet-setting food, we’re used to seeing tomatoes from Mexico in the supermarkets in the US, but what a surprise to find Washington apples here in Mexico as well as organically grown California spinach. 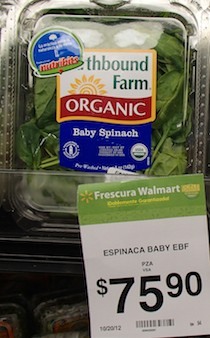 Did this spinach bring a passport? This spinach was a bit wilted (it’s a long flight for a little leaf! ), and the price was $6 USD a box. But it’s available. Matt Damon & Scarlett Johansson – We’ll take it! At night we often settle in with a movie. TV reception is non-existent on the boat, but the bootleg DVD industry is alive and well in Mexico. 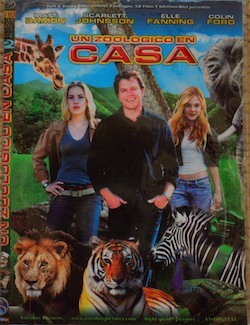 DVD’s are sold on the street for 20 to 30 pesos apiece ($1.60-$2.40 USD). The titles often have no resemblance to the English titles, so you go by the actors’ names and hope for the best. Who knows what this one is, but with Matt Damon and Scarlett Johansson, it oughtta be okay! So we live rather simply, floating in a tub on the ocean and washing our clothes in the sink! It’s a crazy life, but lately it has been fabulous. 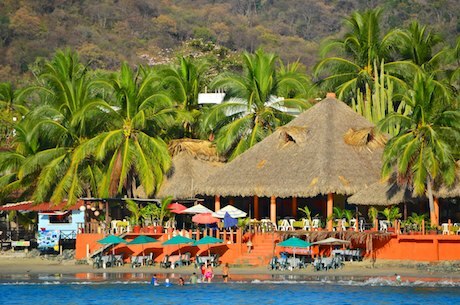 Zihuatanejo – A place people keep coming back to… us included! 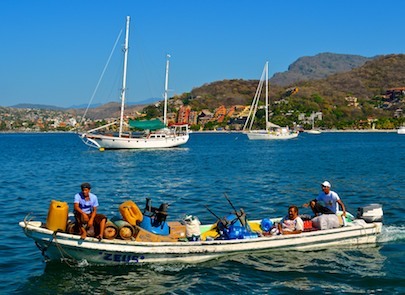 Zihuatanejo bay was busy when we got back. 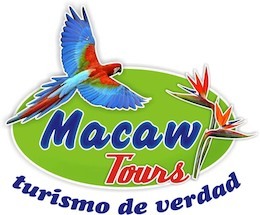 Late February, 2013 – After our whirlwind inland trip to see Morelia, the migrating monarch butterflies and the magical town of Pátzcuaro, life aboard Groovy resumed very happily. 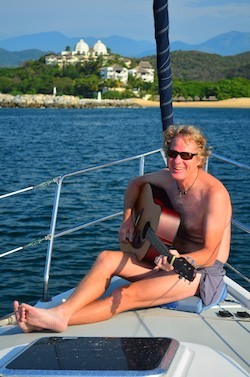 Zihuatanejo is a vacation destination, and tourists were playing around us on the beach and in the water with gusto. This power yacht has chairs & umbrellas! One large motor yacht pulled in near us. They had a wonderful back deck with lounge chairs and umbrellas set out. Now that looked like the way to go cruising! One of our on-shore neighbors. 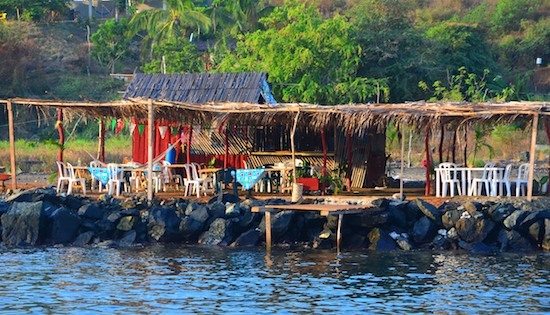 On our other side, along Playa La Ropa (the bay’s biggest beach), there was a series of palapa beach restaurants. They formed the backdrop to our view as the cruising boats came and went around us. Most boats were returning north, but a few were headed south. Two boats with families aboard anchored nearby, and we got a huge kick out of watching the kids playing together. Before we left to go cruising, I had assumed that lots of families were “living the dream” aboard sailboats. The cruising magazines publish lots of stories about cruising families, and it led me to believe the ocean was teeming with young families afloat. Not so! In three years of cruising Mexico, we have met eleven boats with kids on board. So it was a real treat to see two boats cruising together with kids the same age. The girls were ten and eleven, and it was heartwarming to watch them jumping in and out of the water from the backs of their boats. They paddle-boarded over to visit each other, and they played all day with the joy and abandon that I remember from my own ten-year-old beach days. Pretty statue outside Lilly’s restaurant. In the evenings the sun always set off Groovy‘s bow, silently falling into the sea. Even though it happened every afternoon, we never got tired of it. 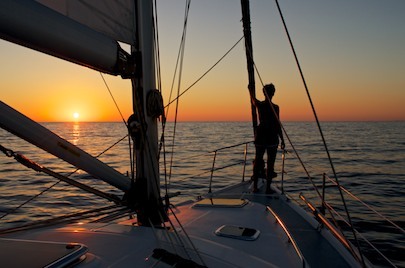 As the light would turn golden around us, we’d both run for our cameras and get up on the bow to catch the last rays. 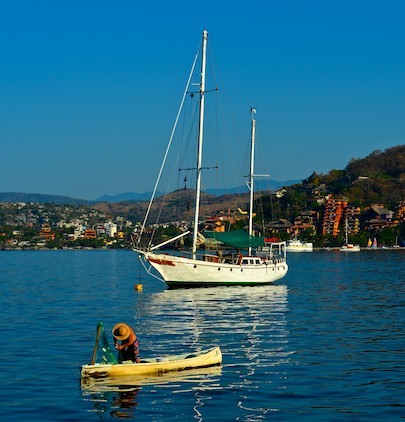 Zihuatanejo is a busy little town with an active waterfront. Just like the sunsets, we never got tired of roaming around and watching all the action. Some serious fish selling goes on in the fish market, with folks of all kinds, from moms to businessmen, stopping by to pick up a little fish for dinner. Whenever we stepped on shore from the dinghy landing on the beach, we always heard funny whistling and singing and talking coming from the rafters of one particular building. 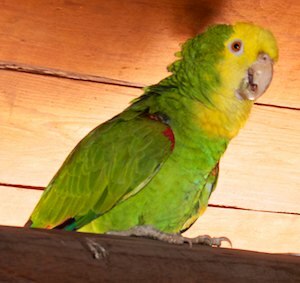 The noise-maker was Socorrito (more formally, “Socorro”), an 18 year old double yellow headed amazon parrot who lives mostly outside her cage in the little store below Lilly’s restaurant. She just loves to sing, and her owner would cajole her into performing for us all the time. She was terrific at improv music making. Great long trilling sounds and operatic vibrato came out of her beak, along with lots of Spanish with perfectly rolled r’s. Mark quietly rolled his eyes at the store owner while I carried on lengthy conversations with her. Francisco shows off a plate. “La Bamba” on a crutch, a harmonica, a ribbed pipe and a screwdriver! 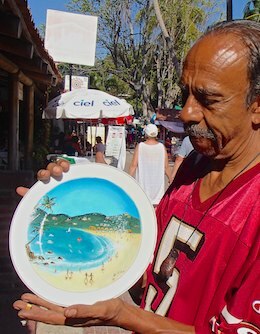 It is nice to return to a place and find things more or less as you left them the year before, and so it was with our friend the plate painter, Francisco de Alba Castillo. Like last year, he had an array of painted plates and spoons on display, and we admired his new ones each time we walked past. As with so many street artists, this is his commercial outlet, but he loves to do fine art too. His next project, he told us, is a very large canvas painting that will show the Hand of God, a mighty fist thrust up into a brooding, lightning-filled sky, with blood dripping from the palm. Yikes! 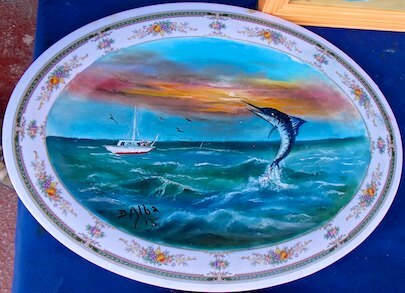 I wouldn’t have expected that from a guy who paints pretty seaside images on plates. But Francisco loves drama, and we got a huge charge out of his animated and flamboyant persona whenever we stopped to chat with him. One of the most engaging things about Mexican seaside towns is the many clever ways people find to entertain and make money from the tourists. 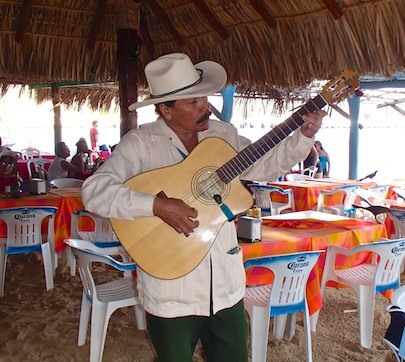 We stopped in a beach palapa restaurant one afternoon for a drink, and along with the usual parade of vendors, a fellow came along making the most bizarre music. We get a tow from a water taxi! 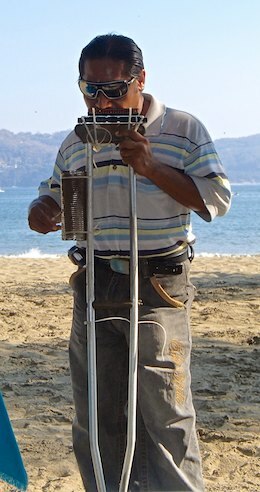 He had rigged up a unique instrument built on a metal crutch. He mounted a harmonica to the top and tie-wrapped a piece of ribbed pipe or tubing to the side. To the bemused smiles of us all, he played a unique rendition of La Bamba. The ragged tune came out of his harmonica while he scraped a large screwdriver against the ribs of the tube for backup rhythm. His performance was worth a few pesos just for sheer inventiveness. 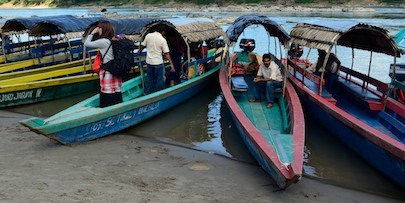 Getting to and from town was an easy mile-long dinghy ride — until the day the prop on our outboard pooped out. 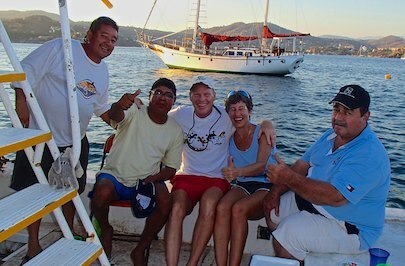 We had “spun” the prop back in Huatulco, and Mark had fixed it, but the bolts sheered on one trip across Z-town bay. Getting it fixed was a fun adventure, but when we got back from the repair shop Mark didn’t have the tools to remount the prop on the outboard. We figured we’d row back to Groovy — good evercise, right? — but it was painfully slow. So Mark hailed a water taxi and we got a tow. Now that was a cool ride!!! “Fiesta Bamba” gets a face lift. 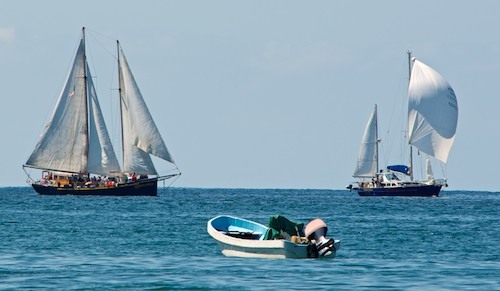 Boat problems are a normal part of boating, no matter what kind of boat you have. 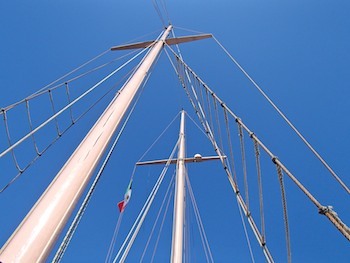 We had anchored next to the elegant ketch Halcyon that was used for daysailing charters. It came and went almost daily, but one afternoon when there was no tour activity, we saw a guy going up the mast to fix something at the top. Luckily the bay wasn’t too rolly that afternoon. Alberto (left) hosts a fiesta aboard Fiesta Bamba. The captain of Halcyon, Alberto, was busily getting another tour boat ready for charter. From before dawn until after sunset his crew was busy banging and scraping away on Fiesta Bamba, and we saw the boat slowly come to life. “One more week and we can do tours!” Alberto proudly told us. He threw a party for all his workers on one of the last days of work, and he invited us to stop over. What a blast! There was enough ceviche and beer to keep a boatload of young, thirsty, hungry and hardworking guys happy, and we joined right in the fun. 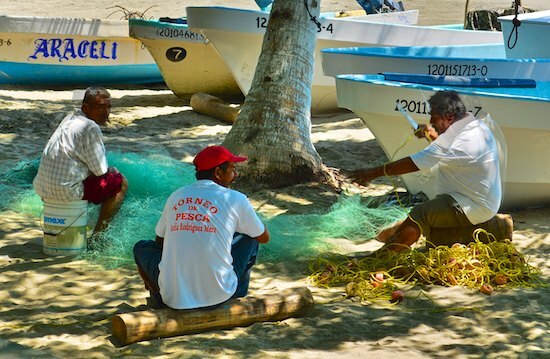 Fishermen mend nets under the shade of palm trees. As with all these seaside towns, the local boat owners are a mix of fishermen and tour operators. The foundation of the local economy comes from the sea. 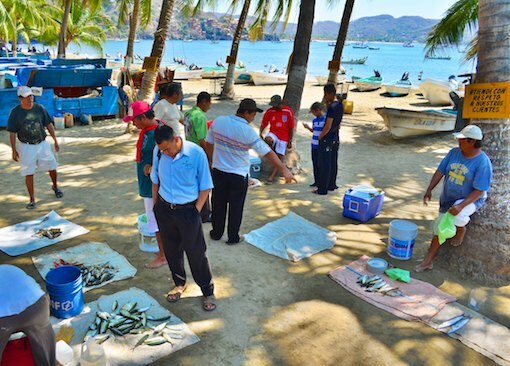 The fishermen mended their nets under the shade of the trees on the beach while the waiters at the restaurants facing the beach capitalized on offering customers the romantic ambiance of dining while overlooking all that authentic fishing activity. Chatting with a water taxi driver one day, we learned that the pangas the fishermen and water taxis drive are all built in Mazatlán. The newer ones are wonderful, sturdy, 20-odd foot fiberglass boats that cost about 30,000 pesos ($2,400 USD) for the basic hull. The popular “panga” has a long history. Water taxis get additional fiberglass shade enclosures added on, and everyone goes for a Yamaha outboard, anywhere from 48 to 75 hp. 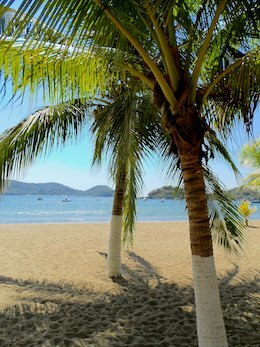 Palm tree on Playa Principal, the main beach in Zihuatanejo. These boats have their origins in canoe shaped boats from eons ago. In his Log from the Sea of Cortez, John Steinbeck describes the 1940’s era boats that paddled out to greeted him in ports along the coast. The panga has come a long way. Some pangas get a fiberglass shade protection build on top. Of course, the correctness of the word “panga” is debated. Many Mexicans have told us a real panga doesn’t have a motor, and that these boats are really “lanchas” because they are outboard driven. 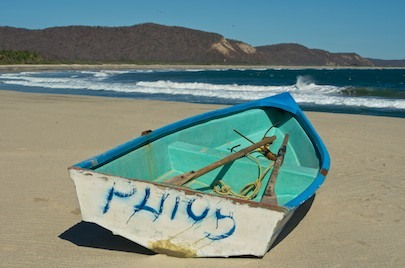 Some Sea of Cortez fishermen even say that “panga” is a gringo word. 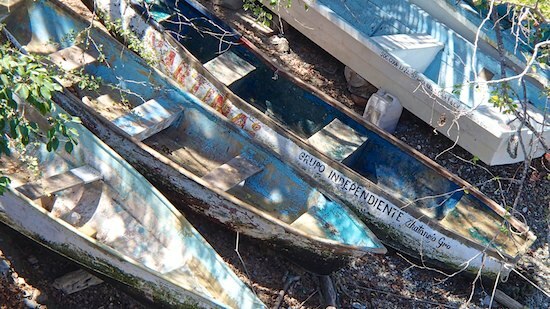 And down in Central America we’ve been told the word “panga” disappears entirely, replaced by “lancha.” Whatever their real name, these boats are everywhere, even 20 miles out to sea. Fisherman statue in a tiny seaside park. Pretty turrets look very inviting! 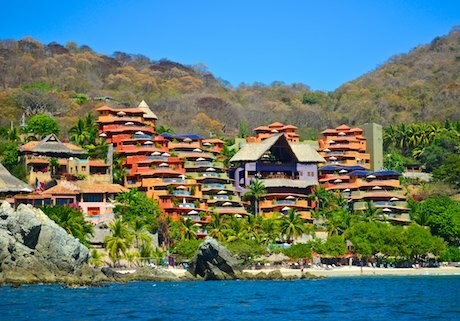 Colorful resorts cascade down to the bay. 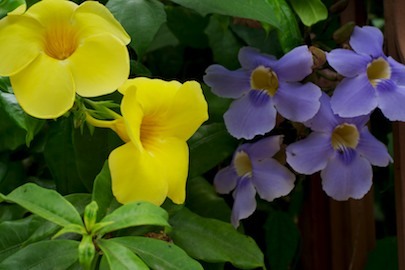 Zihuatanejo is a colorful place, and we enjoyed trying to capture the vibrance of all we saw with our cameras. Another lovely sunset off Groovy’s bow. Some of the resorts that cascade down the hillsides have been painted in rich hues of burnt orange, red and yellow, with inviting shapes and pretty shade palapas. Out in our anchorage we caught yet another pretty sunset off the bow. It’s no wonder people come to this town year after year. And the funny thing was, with this being our third year in Z-town, we were now among those people too! 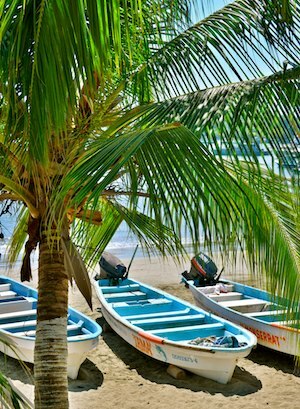 But eventually we felt the urge to move on, and we got ready to sail up the coast to Manzanillo’s incomparable Las Hadas Resort. We woke up to a pretty scene in the bay. 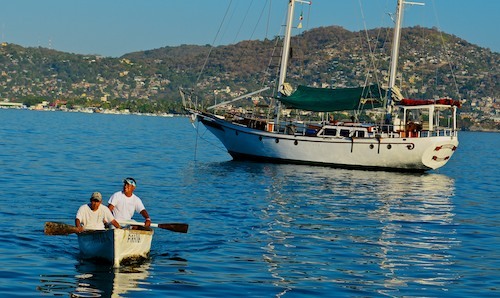 Early February, 2013 – We woke up on our first morning in Zihuatanejo, after sailing up from Huatulco, to find the sun glinting off a neighboring ketch while a fisherman cast his net from a canoe next to us. It was a beautiful, serene sight. 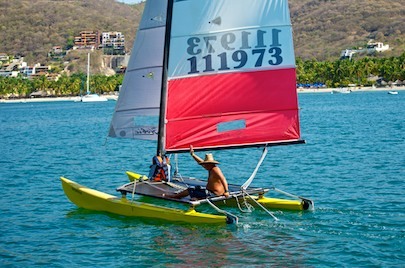 Some catamarans double as launch boats! 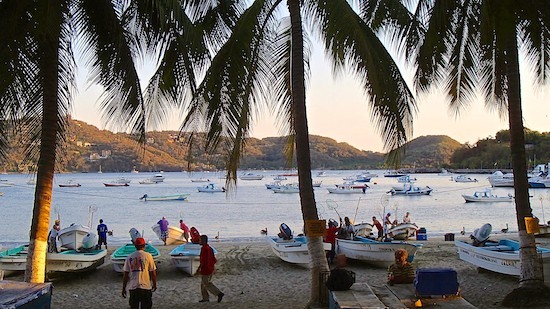 Zihuatanejo is a busy bay once all the tourists wake up and get going. It is lined with beaches, villas, restaurants and resorts, but our little corner by boat-in-only Playa Las Gatas got only those visitors who came by in by watercraft. Lots of people rent catamarans to sail in the bay, and one catamaran owner was even using his as a launch boat to deliver people to the beach on the opposite shore. What a fun way to get across the bay! Daniel visits us in his canoe. One very enterprising fellow, Daniel, paddled his way around the bay in a canoe, visiting every cruising boat he could find to offer his services cleaning barnacles and seaweed off the bottoms of their boat and offering to wax the hulls too. He was disappointed to find that we had just cleaned Groovy’s bottom ourselves. What a crazy cleaning that had been. 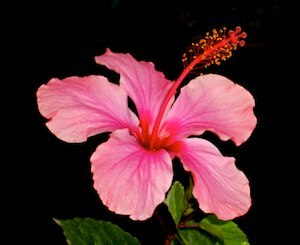 We had done our usual routine with the paint scrapers and Scotch Brite pads, scraping off the thick grass skirt that Groovy had begun to wear. We had no idea that hidden in the fluffy green seaweed were hundreds of baby crabs, about the size of mosquitos, until we got out of the water and discovered we were both covered with them. We jumped back in, screaming, and frantically swiped each other’s backs and arms and legs to get them off. But when I took my shower a few minutes later, I found a pile of them scampering around my feet. Yuck!! Crazier still, when we told Daniel about this, he topped our story completely: one had gotten into his ear and he was still waiting for it to crawl out. 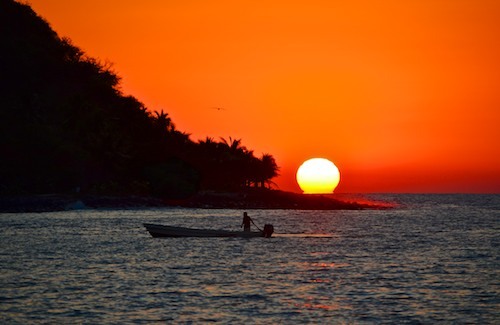 Life on a boat in the tropics can be idyllic, but you live awfully close to nature!! Another visitor to our boat was one we had looked forward to for a long time. 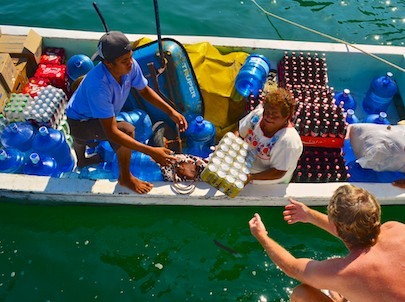 Local vendors Hilda and Ismael sell water taxi tickets at a kiosk in town and they also supply the palapa bars on boat-in only Las Gatas beach with all their inventory. So they are perfectly set up to deliver anything and everything a cruiser could possibly want, right to the boat. It’s much easier to have heavy things delivered than to lug them around by dinghy and on foot! We put in our order for cases of coke and beer (much easier than hauling all those heavy cans via taxi, a walk to the beach, and a long dinghy ride out to the boat, so we stocked up!). We also gave Hilda our dirty laundry and empty propane tank. The full propane tank and clean laundry were delivered to us the next day. What a great service!! 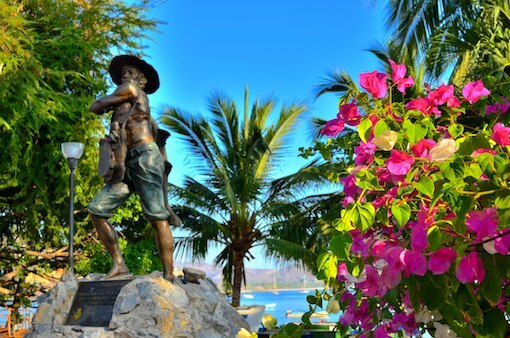 Arriving on shore at Zihuatanejo’s main beach, Playa Principal, we strolled the pretty, tree-lined, waterfront walking paths with a strong sense of nostalgia. This was our third season of visiting Z-town, and it was still as inviting, fun and funky as ever. 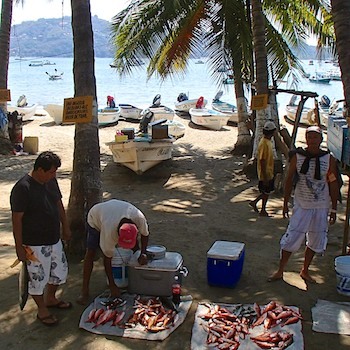 The ZIhuatanejo fish market is a busy place on the main beach. 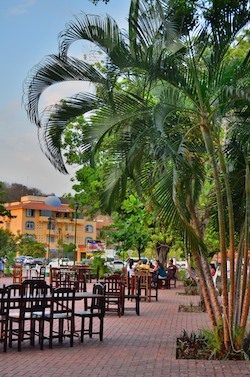 The walking path along the shore is lined with boutique shops on one side and a large open air fish market under palm trees on the beach on the other side. Fish at this market is about as fresh as it comes. 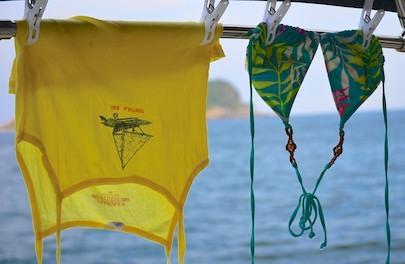 The fishing pangas land right on the beach, and the catch immediately goes on sale on tarps in the sand. Fishermen show off today’s catch: red snapper. 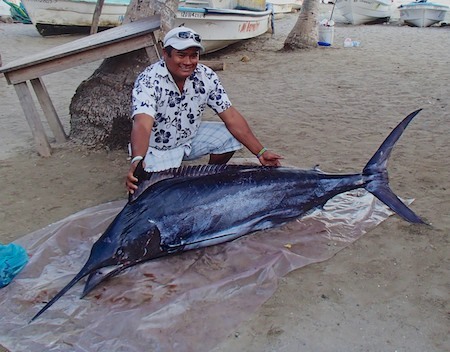 One day while strolling past the fish market we saw a very happy fisherman showing off the marlin he had caught. Now that’s a fish!! 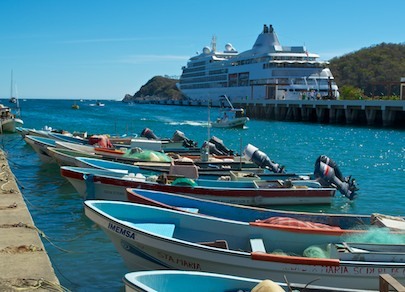 Zihuatanejo is a walking town, and the first few streets along the waterfront have been designated as pedestrian only. This makes for a very casual and comfortable feeling, as you don’t have to dodge the traffic and you can stop and chat with vendors and tourists at leisure, and check out all the shops along the way. 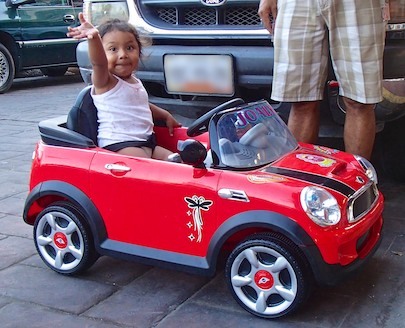 Zihuatanejo is a walking town for most, but this little princess drives around town in style! Of course, there are those among us who are little princesses, and they demand a sweet ride in a cool car regardless of which roads are pedestrian-only!! 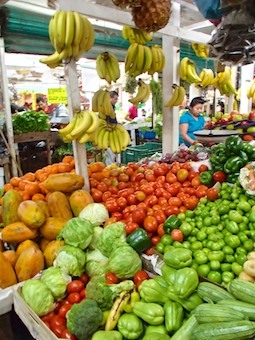 Zihuatanejo’s colorful “mercado” sells everything under the sun. Walking in from the waterfront about half a mile, there is a large “mercado,” or public market, where fresh veggies, fish and meat are sold alongside kitchenware, brooms, baskets and hats. It is a crazy jumble of little stalls housed inside a building that fills a whole city block. If one guy doesn’t have what you’re looking for, he’ll direct you to the next guy that might. In short order we had all the provisions we needed for the boat, including new Scotch Brite pads for the next boat bottom cleaning! The sun melts into the sea off our bow. Back on Groovy we were treated to a nightly dance of color off our bow. 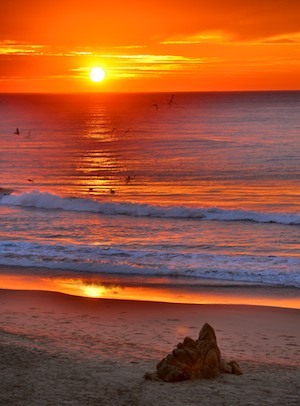 A huge ball of fire would sink into the waves, turning the sky brilliant orange. Even though our photos from one night to the next had a striking similarity, it was still a thrill to sit on the bow and watch the sun disappear. One last wink, and then goodnight! Every so often, when the earth’s atmosphere is just right, the sun bursts with a flare of green just before it vanishes. 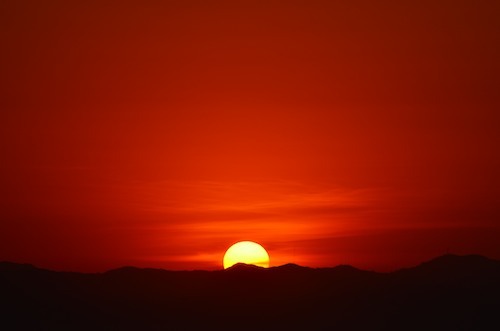 We’ve met sailors who have been around the world who swear there is no such thing as the “green flash,” but we have seen it several times. We never know when it will happen — most of the time the sun slips away without any fuss — but when the green flash comes, we are always elated. The “green flash” is real!! One night, while sitting on the bow and lining up those same old sunset shots, we were both completely startled when it happened. “That was it! !” I cried. Amazingly, Mark managed to catch it on camera at almost the perfect moment. 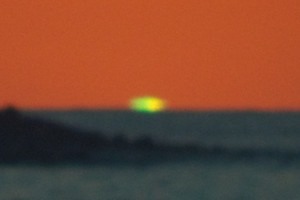 It’s a little like a blurry UFO shot, but it’s there — the green flash! 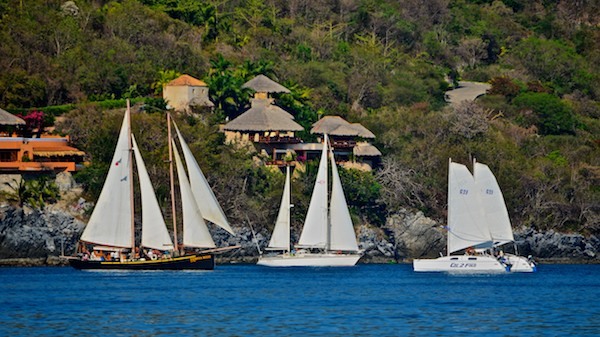 Cruisers flock to Zihuatanejo in early February to take part in the Zihuatanejo Sail Fest, a five day fund raising event celebrating both sailing and Mexican culture that provides educational support for the children of the area. 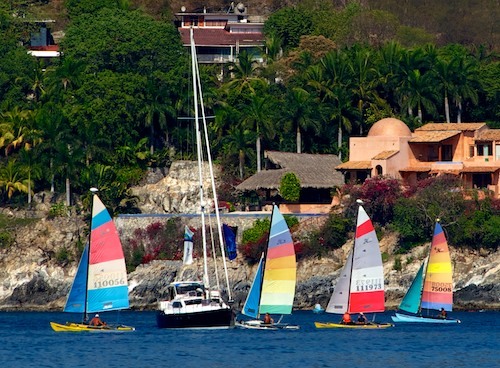 The most colorful aspects of this event on the water are the pursuit sailing race and the boat parade. The boats filled their rigging with colorful flags (the nautical alphabet), and took off around the bay in a wonderful show. 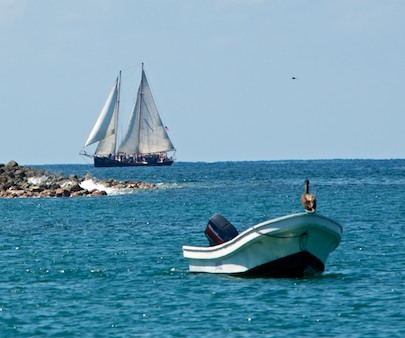 The leader of the sailing event this year was our friend Pamela Bendall, the incredible single-hander from Canada who has sailed her 46′ steel boat, Precious Metal, as far as Peru. Committee boat “Precious Metal” is surrounded by racing catamarans. Her boat was the “committee boat” for the pursuit race, and when she was suddenly encircled with racing catamarans, her boat looked like a mother swan surrounded by little rainbow colored goslings. Another priceless moment came when three double masted boats all sailed together for a few seconds. There was a schooner (Patricia Belle), a ketch (Liebling) and a unique double masted catamaran that is wish-bone rigged like a wind surfer and that miraculously folds up (Cat-2-Fold). Schooner Patricia Belle in full glory on the horizon. 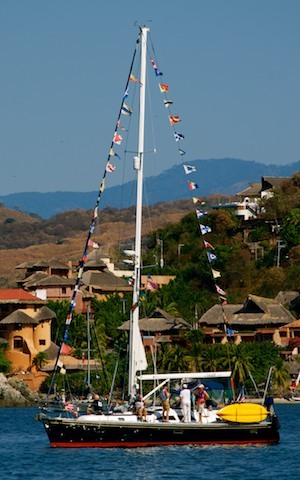 Pamela proudly reported that Sail Fest raised $67,000 (USD) for the children of Zihuatanejo this year. It is rare to see large boats out sailing in this bay, as most cruisers arrive or depart under engine power with their sails furled. But on this special day the boats had all their sails up, making for some inspiring nautical images. The schooner, in particular, was very cool to watch, sailing with four sails raised. We had a blast photographing all these beautiful boats. The racers return to the bay. We stopped by the schooner to learn more about it, and discovered she has a wonderful and unusual story. 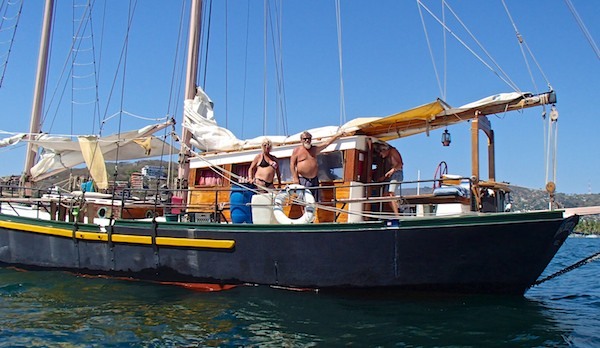 Patricia Belle is 65′ long (82′ on deck, including the very long bowsprit), and owners Pat and Jeann have lived and cruised aboard her for fifteen years. Pat was a sea captain and shipwright for his entire adult life and had built seven boats, some as big as 30′, before designing and building this one. We were lucky to get a tour of Patricia Belle. 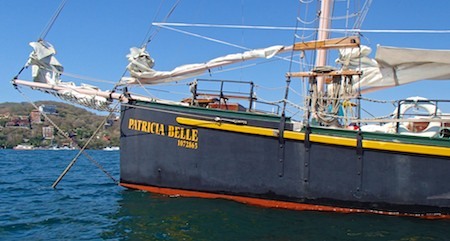 Patricia Belle was a special project, designed and built by Pat to match the lines of an old steel fishing vessel he admired. When he says he built this boat, he truly means that his hands did all the labor. And what a labor of love she is. There is surely a tale behind every joint and piece of rigging, and we were lucky enough to hear a few. There was a crowd on board when we stopped by, so adding two more was not a problem. Captain Pat shows us the steering mechanism that he took from an old dump truck. 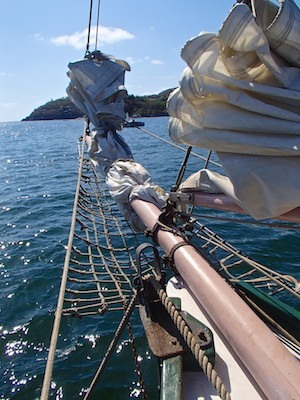 We leaped up on deck and were enchanted by what we saw: tall rigging with rope ladders to get up the mast, and a solid bowsprit bearing two furled jibs. Built of wood between 1994 and 1997, Patricia Belle was launched in California in 1998 and promptly sailed to Nicaragua. She weighs 100,000 lbs., which turns out to be the same weight as the old Ford dump truck whose steering mechanism Pat borrowed to install in his beloved schooner. Below decks has a wonderful old pirate ship feeling! The keel is 21′ long, and it is 9′ deep for the entire length, making the boat track like it’s on rails. The rudder is also very over-sized, which makes her able to turn quite easily. 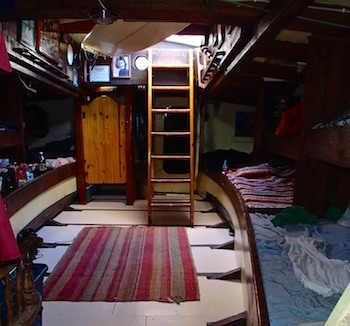 Down below, the crew’s bunks are stacked two high in one stateroom, and the crew get in and out by a wooden ladder. Some of Pat’s and Jeann’s friends had been cruising with them on Patricia Belle for a month or more, and some still had another month or so of cruising to go. What a fun way to spend the winter! Pat and Jeann used to host guests for charters aboard Patricia Belle, but now they are enjoying pure retirement. All their cruising these days is just for their own pleasure. Pat and Jeann used to offer charters aboard Patricia Belle, but now they enjoy simply cruising with friends. One morning when we woke up they were gone — south to Acapulco. 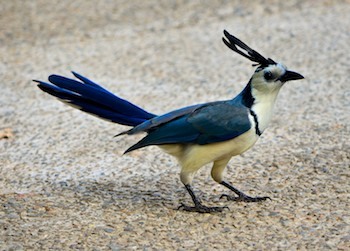 But they will be returning north towards Puerto Vallarta later in the season. Hopefully we will see the pretty lines of this beautiful schooner out on the ocean once again. 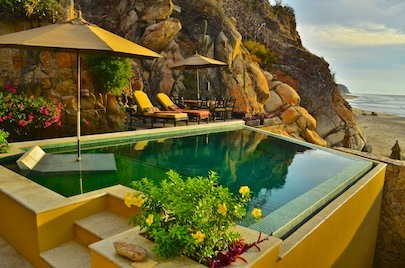 We still had plenty of things on our agenda for our stay in Zihuatanejo, however. We had friends to meet up with on shore and a boat project or two to take care of. 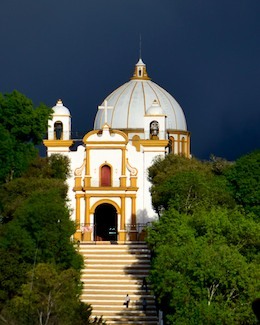 But most exciting of all was our upcoming trip inland to visit the beautiful colonial city of Morelia. Once underway we got excited about the thrills that lay ahead. 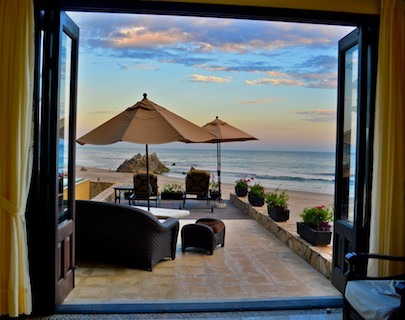 Late January, 2013 – It was hard for us to leave Huatulco, but once we got underway we began thinking about the adventures that lay ahead of us. Suddenly we were excited to be on our way to the funky town of Zihuatanejo. Life on a long passage has a different pace than life at anchor or on land, and it always takes us a while to settle in. We had a lovely sunny day to start our passage, but not quite enough wind to sail without having the engine running at the same time. We hung out in the cockpit and watched the world inch by. Mark saw the breach… all I caught was the tail end. 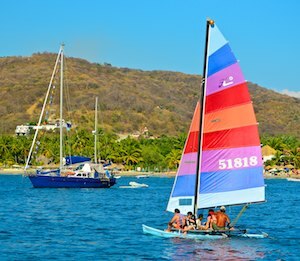 We had 55 hours or so at sea ahead of us before we reached Zihuatanejo 350 miles away, so what was the rush to do anything? Then Mark suddenly jumped up, “Did you see THAT??! 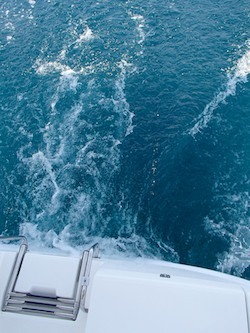 !” I followed where he was pointing and saw an enormous splash and spray of water about 100 yards from the boat. A whale had breached and fallen back into the water. 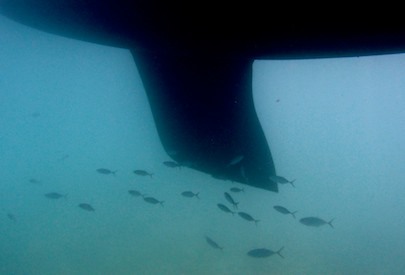 We scrambled for the cameras and got all set up for the next breach, but it never came. There were four whales traveling north, and they lobbed alongside us for a few minutes. Then, one by one, they dove deep into the water. Sailing closer to shore makes a more interesting voyage. People often ask us how far out we travel, and usually we follow the coastline about two miles offshore. But on this passage we decided to stay within one mile so we could see the shoreline better. The little communities that dot this part of this coast slowly came and went, sometimes giving us internet access for a little while, and always offering us something to look at through the binoculars. Traveling at 6-8 mph, we would laugh now and then and say, “Are we there yet?” We could jog faster!! The sun finally began to set and we watched it slip into the sea. We hadn’t seen any other boats all day, and we were still alone on the ocean. We had only each other to share this precious moment. There is something both primal and eerie about watching the sun fall out of the sky at sea. The brilliant colors of its last wave goodbye are comforting, but night steals over the sky all too fast. We put on our harnesses, clipped ourselves onto the line that traverses the cockpit, and waited for darkness to fill our world. We hadn’t run our jacklines, those safety lines that go around the perimeter of the boat and make it possible to walk the full length of the deck on a moveable leash. 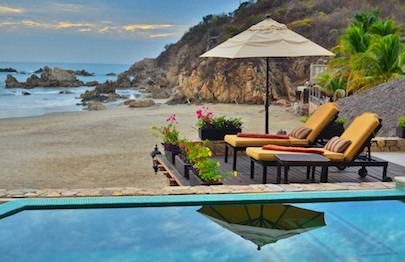 Huatulco had made us lazy! 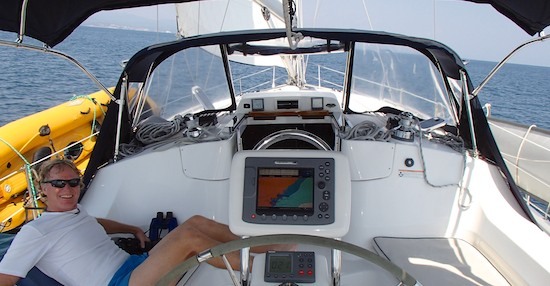 However, in 20 nights or so at sea we had never had to leave the cockpit of the boat, so the jacklines had been unnecessary to date. What were the chances we’d need to go out on deck to fix something on this very calm night? 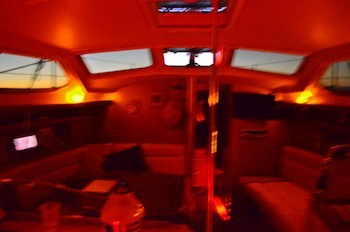 We keep the cabin dimly lit at night to retain our night vision as much as possible. We also spend most of our nights at sea down in the cabin, poking our heads into the cockpit every 15 minutes to look around, check the radar and check our progress. Groovy barrels along in the pitch dark under the guidance of the autopilot, and we just hope there’s nothing in our path. 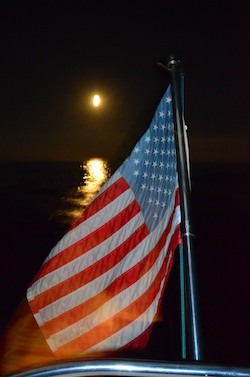 The full moon’s light plays on our ensign. The moon rose like an old friend behind us and we played around trying to capture its essence with the cameras for a while. The boat was gently riding up and down over the waves, so the combination of a moving platform and dim lighting conspired to make blurry photos. But I loved the effect Mark got with our flag and the moon. The small waves in the early evening became large rollers by midnight, rushing towards us with lots of speed and enthusiasm. Groovy was doing a flying crash-dance, riding up a wave until half airborne and then falling into the trough behind it. It was a magic carpet ride, especially on the innerspring mattress in the v-berth. The springs and the boat’s motion levitated me into the air on a spongy ride. Occasionally I bounced like I was on a trampoline. Lying there on my back, I was traveling feet first, and it seemed very much like being on a luge. The waves noisily slapped the hull on either side of me and the boat rolled and pitched while the mattress bounced and flexed. Sleep? Are you kidding?? Mark wisely took a spot on a settee in the middle of the boat (where the motion is less bouncy) when he was off-watch, and he got some really good shut-eye. Dawn, after a night at sea, has a slightly raw feeling to it, and this morning was no different. A hot shower and some coffee and tea helped us shake the night away, and we puttered around looking for things to keep us occupied. The wind was still too light for sailing without the engine. 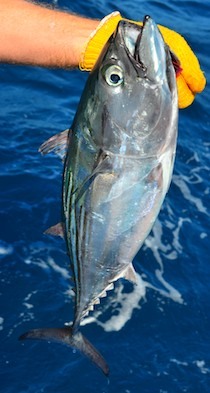 Mark threw a hand-line off the transom to try and catch something. Suddenly it went taught with a fish jerking the other end. Is this one good eating?? He reeled in the silver beauty, hoping for a dorado (mahi-mahi), while I hoped it would be something inedible we could throw back. These things don’t come with signs on them saying, “I make a really great fillet – just toss me in the frying pan with butter and some veggies…” Instead, we studied the fish and studied the fish book. It appeared to be a Pacific Bonito, not the best tasting. So back he went, vanishing as soon as his fins hit the water. Soon we had another fish on the line, and it was the same type of fish. Back it went, again to my relief, as butchering a large fish in the cockpit is quite bloody and rather barbaric. Yet the thrill of getting a fish on the hook is undeniable. Ironically, studying the fish book and our photos a few hours later, we realized these fish were Mexican Bonito, which is said to be quite tasty. Oops!! 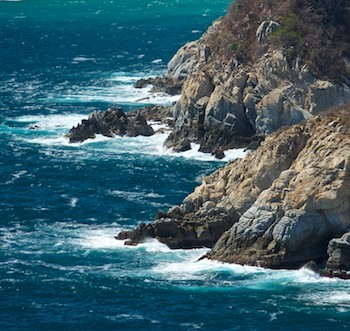 The ocean near Acapulco is the bluest we’ve seen in Mexico. 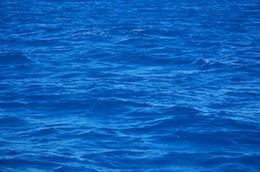 The water outside of Acapulco is about the bluest we’ve seen anywhere, and for miles we admired the beautiful shades that played between the waves. Even outer Acapulco’s skyline has lots of highrises. As we approached Acapulco in the late afternoon after 34 hours or so at sea, the shoreline began to fill in with high-rise buildings. Many have an industrial sameness about them, but one was curved, making us wonder at first if something was up with the binocular lenses!! 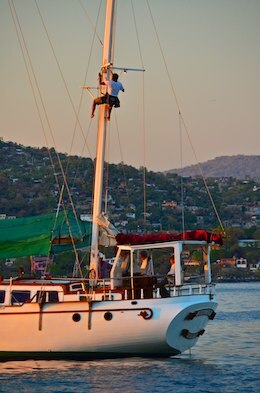 We had been planning to do another night at sea, arriving in ZIhuatanejo the following afternoon. 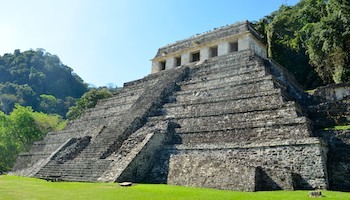 But we suddenly realized Acapulco would make a great stopover. 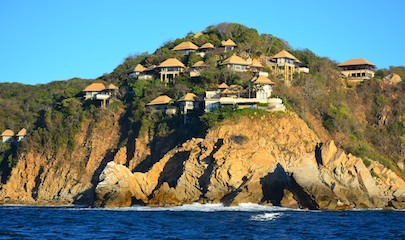 Staying here we could reach Zihuatanejo in two day-sails rather than do another overnight at sea. Yay! Pretty villas perch on the cliffs in Puerto Marques. 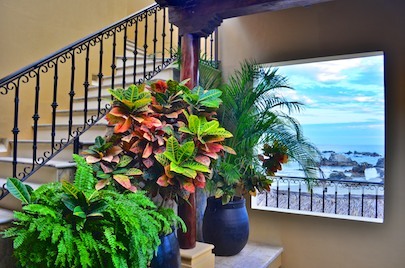 Rounding the bend into Puerto Marques, a pretty bay south of Acapulco’s main bay, the buildings became picturesque villas that clung to the edges of the cliffs on stilts and undoubtedly made for very swank living. 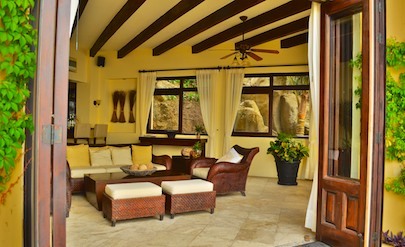 Our private little corner in Puerto Marques on the outskirts of Acapulco’s main bay. 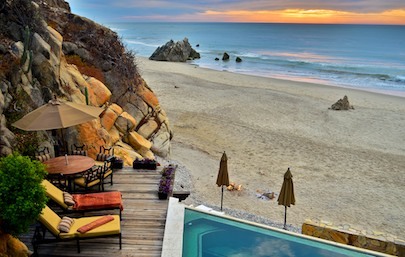 What a great little spot to spend a few days, get some quality sleep, and break up the trip! We dropped the hook to the sounds of parrots in the trees and watched the lights in the resort next to us come on one by one. The next day vacationers circled us in small tour boats, and a luxury charter megayacht joined us in the anchorage. A little sailboat glinted in the sun and made orange reflections in the water as it went past. A little sailboat’s sail reflects orange in the water of Puerto Marques. There is always something that needs a little TLC on a boat, and this time it was the engine’s packing gland, a sleeve that wraps around the drive shaft and seals out the salt water. It can be adjusted so just the right amount of salt water drips into the bilge, around one drip ten or fifteen seconds. Ours had been dribbling a little faster than that. Riding a late afternoon breeze. Mark is ready to tackle the packing gland. 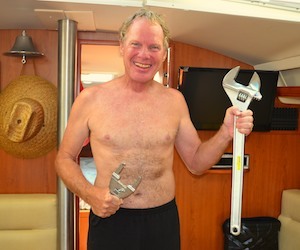 The small wrench in Mark’s right hand here is a specialty “packing gland wrench.” But the big wrench in his left hand is what he had to use the first time he cracked the frozen locking nut on our new-to-us boat after the specialty wrench broke. Now he uses both together (West Marine warrantied the broken one) and it spins freely. Where do we store an enormous wrench like that? Under the mattress, of course!! 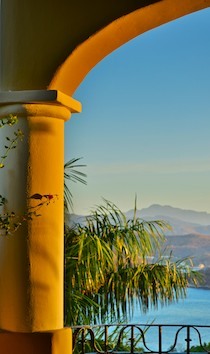 The sun rises over Acapulco’s hills in our wake. After a few days we got up one morning before dawn and sailed out of Puerto Marques. 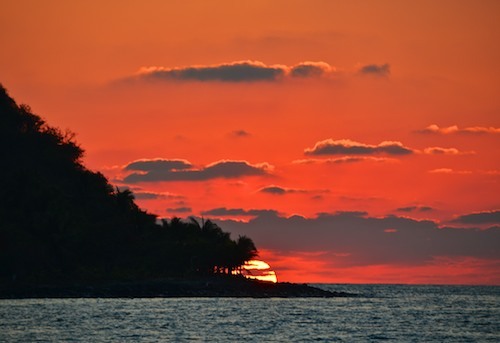 Looking back over our transom, we watched the sun rise in rich shades of red and orange over the hills of Acapulco in our wake. Gliding up the coast at 7 mph. Passage-making is hard work (smile!). Passagemaking is a pretty tranquil thing to do on hot sunny days. Between naps, Mark kept an eye on all the boat’s systems. He monitored the new alternator’s performance and was happy to see it cranking out nearly 80 amps. The new Smart Charger that had overheated on our last long tropical passage stayed nice and cool in its new home outside the engine compartment. The clamp-on volt meter shows the new alternator is working. At the end of the day, we pulled into Papanoa, a little fishing village with a small breakwater to protect us from the ocean for the night. 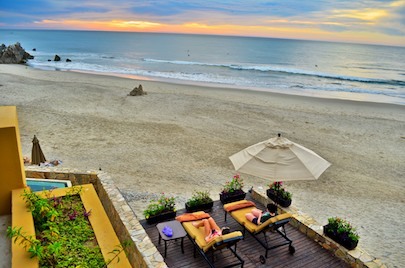 There isn’t much there other than seabirds, fishermen and a palapa bar that hosted happy local patrons until the wee hours of the morning. The palapa bar at Papanoa, a small fishing harbor. Weighing anchor in Papanoa’s tiny harbor. Morning light on Papanoa’s lighthouse and breakwater. We weighed anchor in beautiful and peaceful morning light, and we puttered out of the harbor shortly after the fishermen had gone out to sea for the day’s catch. What a delight it was a little while later when a school of leaping manta rays started hurling themselves out of the flat calm water nearby. These alien looking creatures seem to love leaping into the sky and doing somersaults. One going up and one going down. Sheer joy at being alive! Perhaps scientists know of a survivalist reason they do this, but to us it looks like they are so happy to be alive they just want to jump for joy. We should all feel that way!! 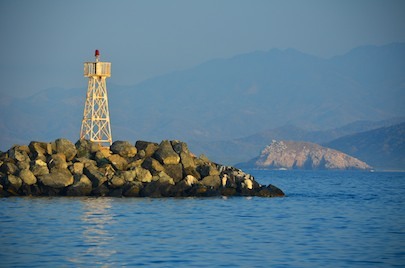 Before long the lighthouse that marks the entrance to Zihuatanejo came into view. 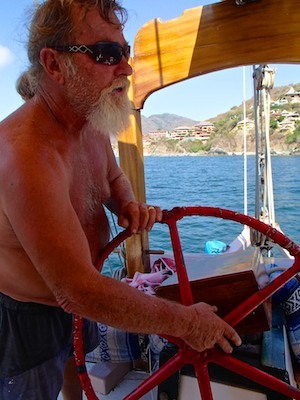 We rounded the bend and were greeted with the familiar and colorful sight of Zihuatanejo Bay. 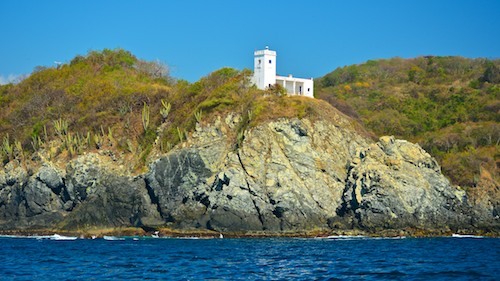 A welcome sight – Zihuatanejo’s lighthouse. 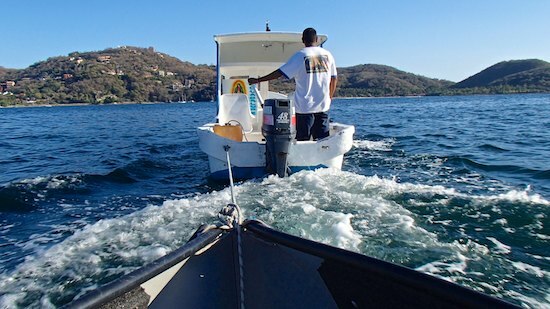 Coming into the bay in Zihuatanejo. The memories of our many past days in this anchorage came flooding over us, and we found a quiet spot in the corner off of Las Gatas Beach to set up housekeeping for a few weeks. 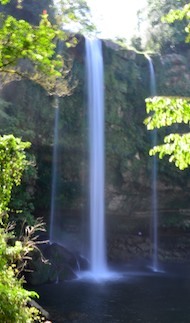 It had been an enjoyable passage, full of natural wonders and solitude. Now it was time to meet up with some other cruisers and enjoy the sights of Z-town. 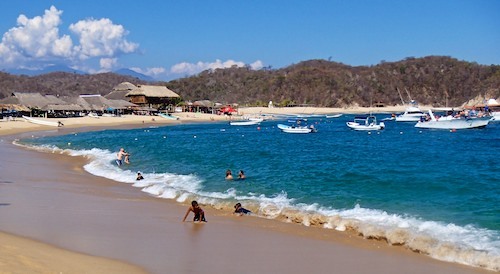 Playa Entrega is one of Huatulco’s best beaches. 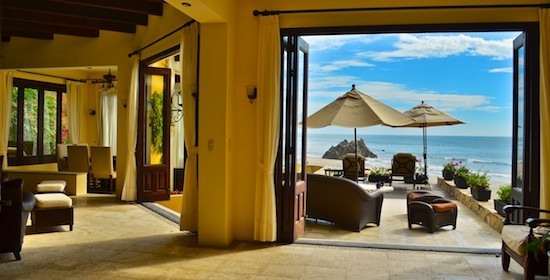 Late January, 2013 – After all the fun we’d had with our new friends on the luxurious properties of Villa Escondida and Las Palmas, we wondered if we would ever have the heart to leave Huatulco, Mexico. This little seaside community had enchanted us for three months. View of the cruise ship dock from our boat. Pier in the little Santa Cruz harbor. 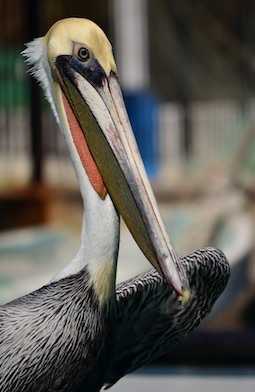 A pelican checks us out. 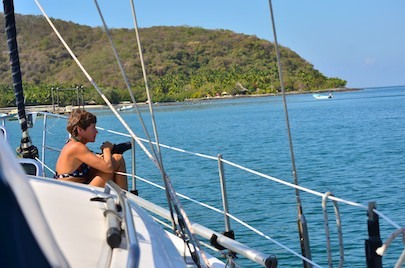 For two of those months we had been anchored in Santa Cruz Bay. We had been there so long that the exposed part of our anchor had become encrusted with barnacles. I guess that’s the cruising equivalent of putting down roots!! As we began thinking about leaving, we realized we would have to spend at least one night at sea. 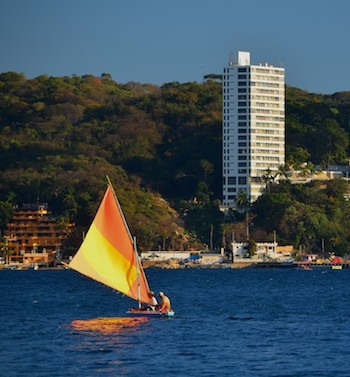 Although there are a few marginal places to stay overnight along this coast, none sounded all that inviting until Acapulco, which is 210 nautical miles away. 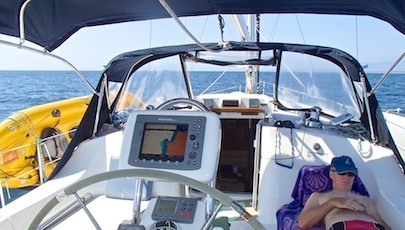 Traveling at an average of 6-7 knots, that’s a minimum of 30 hours “on the road.” Zihuatanejo was 140 miles further. It is much easier to see at night on the ocean when there is a full (or nearly full) moon. Otherwise there is no horizon, and the ocean and the sky become indistinguishable. It’s very eerie. This guitarist belted out “Alla en el rancho grande” to everyone’s delight. Having a moon in the sky is also more comforting, as those inky black waves lapping the outside of the hull from the pitch dark bottomless depths can wreak havoc on your imagination. So we had planned to leave when the moon was full, or as close to full as possible. That would be at the end of the month, which gave us plenty of time to prepare. 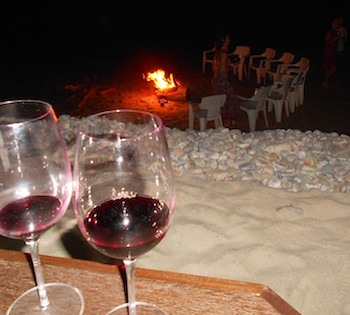 We slowly made the rounds to our favorite places to say “goodbye.” Over at Santa Cruz beach we enjoyed final beach-side beers served by two waiters we had befriended, Eugenio and Martín. Eugenio brings joy to patrons. 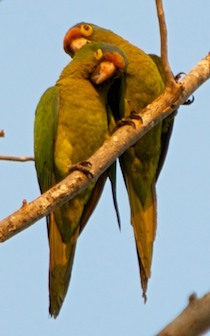 The parrots smooched in the trees every night. And after having watched the strolling guitarist-singers for months, we finally asked one to play us a song. We chose “Alla en el rancho grande,” after listening to an inspiring rendition of this song on a CD by our friend, cowboy poet Don Cadden. We walked the docks and got final pics of whatever we could think of — all those special things we’d seen day after day and wanted to take with us as images to reminisce with in the future. 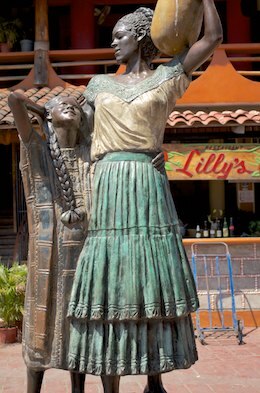 One of our favorite hangouts had been in the middle of the charming town square in Santa Cruz where there was a little kiosk bistro calle Cafe Huatulco. 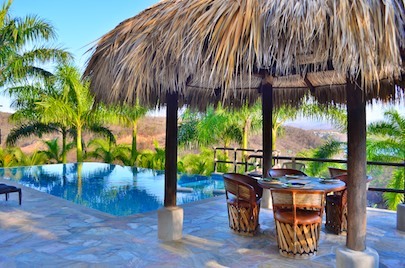 It is a delightful place to while away an afternoon or evening, and during our time in Huatulco we had spent many an hour there. 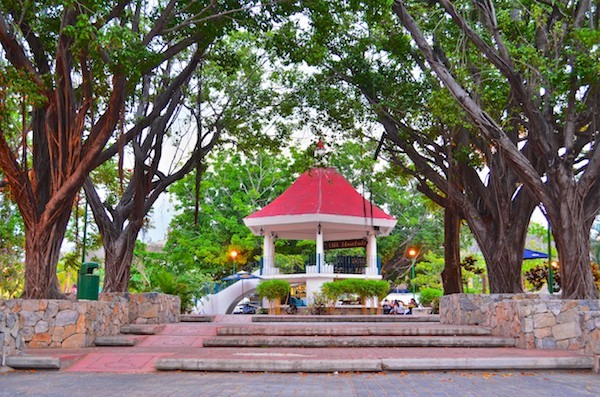 The pretty town square in Santa Cruz. 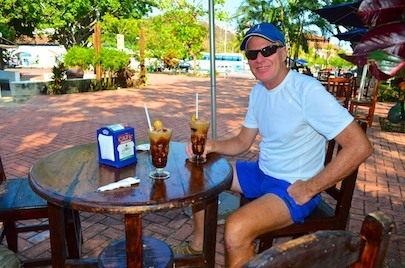 A great place to enjoy an ice cream coffee drink. 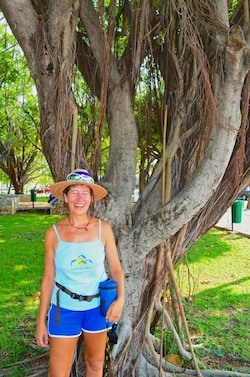 We loved the huge, exotic shade trees in the town square. So back we went to find a shady spot under the truly exotic and enormous trees for one last frappé ice-cream-coffee drink. Yum! One of the crazy things about writing a blog is that sometimes you realize after the fact that a past post is missing something important. And so it was with our pictures from Villa Escondida. One of Mark’s favorites that he took while we were there was of a little statue decoration in the house that I’ve added here. She looks like we always felt after those yummy frappés. 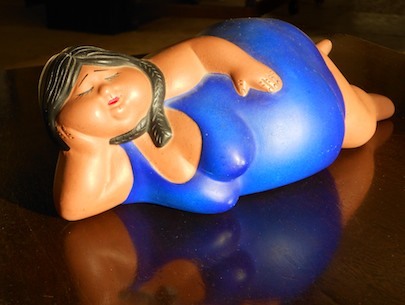 This chubby lady must have just been to Cafe Huatulco and slurped down one of those tasty ice cream coffee frappés. Installing the new alternator – fun fun fun! 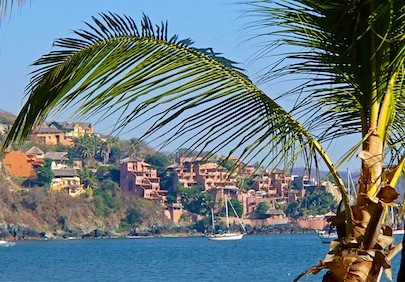 When we first arrived in Huatulco, around Halloween, we discovered that our 35 hour dash across the Gulf of Tehuantepec had fried the “smart charger” on our alternator. This little gizmo controls how much current the engine alternator puts into the batteries. We learned the hard way that these smart chargers are extremely heat sensitive. We had made the crossing motor-sailing at a slightly faster pace than our usual cruising speed, and the ambient temperature in the cabin had been well over 90 degrees F the whole time. This is more like it – real fun! To top it off, the original installation of the smart charger was right next to the engine in an enclosed compartment. That is a recipe for disaster! 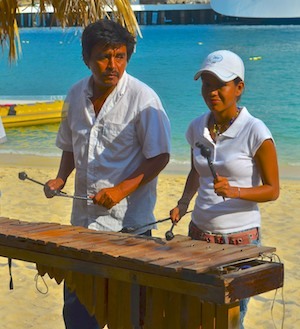 Playing the marimba on the beach. Since we had already had the alternator rebuilt once, we decided to buy a new alternator / smart charger kit. Bringing things into Mexico is not easy, and we went down various avenues to try to figure out how to get our hands on one of these kits. After four weeks of hemming and hawing, West Marine had told us it would cost $953 to ship the 20 lb. 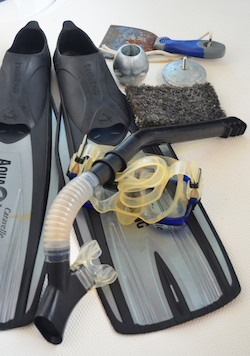 kit to Marina Chahué in Huatulco. 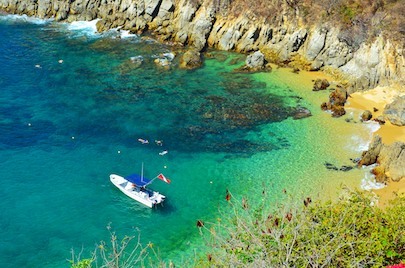 Huatulco’s roots are fishing but it’s now a beautiful tourist destination. That fee didn’t include the purchase price of the kit, the California sales tax, or the Mexican import duty! Geez. For that price, rather than shipping the part, one of us could fly to San Diego, pick one up, and bring it back!! So much for working with West Marine. 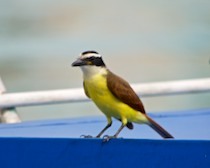 This little kiskadee has a great big voice! We explored other methods, but each had its issues and complications. 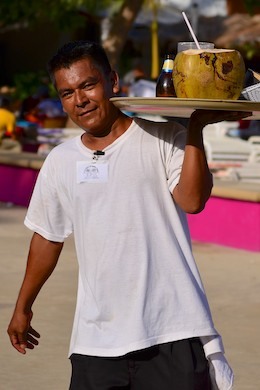 Then our hero and friend Ron from Las Palmas offered to bring one down when he flew back to Huatulco after a trip home. Wow. What a godsend!! We couldn’t believe our good luck. 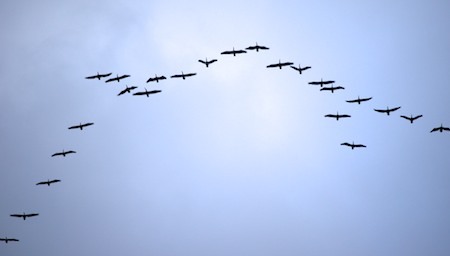 Pelicans flying overhead remind us there are many more distant horizons to explore. 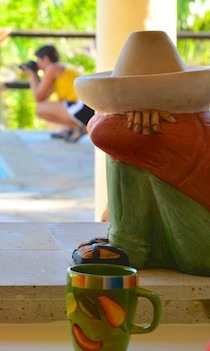 Fortunately, Huatulco was an awesome place to hang around while we were sorting all these things out. 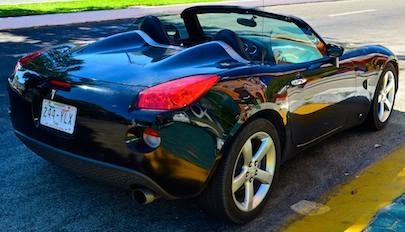 However, after months of glorious fun visiting orchards, playing on the beach, making new friends and prancing around five star resorts like royalty, Mark finally got down to business and installed the new alternator and smart charger (he gave that little beastie a cool room of its own outside the engine compartment). So, very sadly, it appeared it was at last time for us to move on. Gulls line up on a buoy facing the sun. We checked the calendar again and suddenly realized the full moon was coming much sooner than we’d expected. Oh no! Suddenly the gradual goodbyes and leave-taking I had imagined got compressed into a few very busy days. 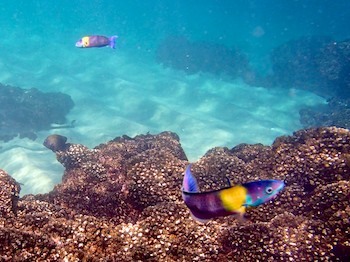 Fish on the reef at San Agostín beach. 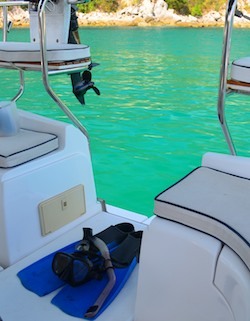 On our last day in Huatulco, we took some friends on a daysail out to the northernmost bay, San Agostín, where we discovered yet another snorkeling paradise on a sensational reef. 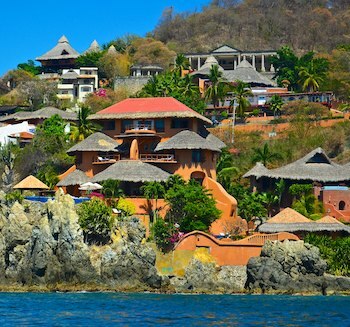 What an amazing place these Bays of Huatulco are. 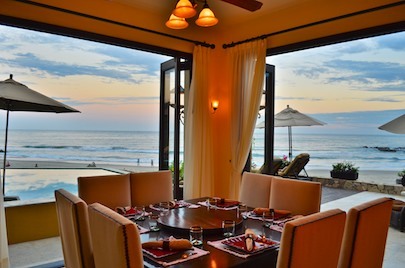 We could easily stay for another month! But we had to go… Or did we?? 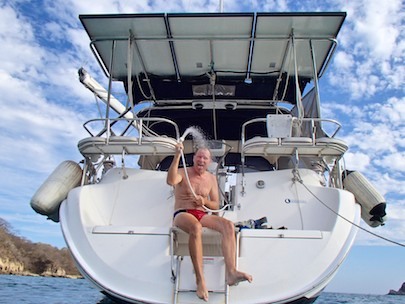 Our friends caught a cab back to Santa Cruz while we prepared the boat for a double overnight 350 mile passage to Zihuatanejo, our emotions in turmoil. 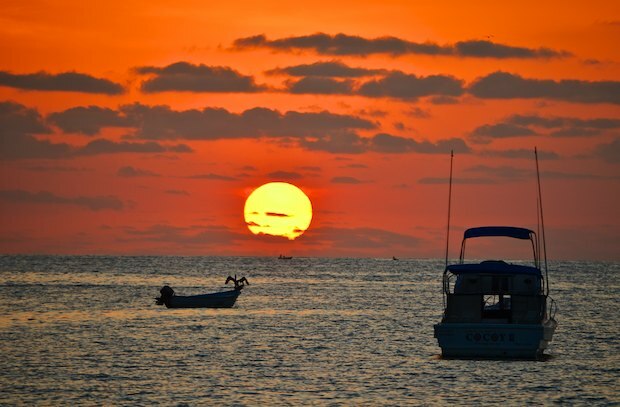 “Well, now we’ve got to break down the dinghy and tie it on deck,” Mark said as the sun was setting. I made a face. He made a face back. Did we really have to go? There would be another full moon in a month. Why not stay four more weeks? We both sighed. 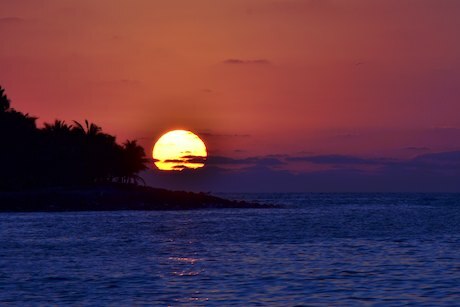 Sunset on Groovy… goodbye Huatulco!! We both grinned, happy to abandon the dinghy breakdown project. 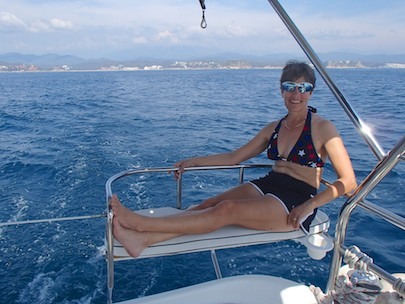 We toasted our sudden and brilliant decision to stay in Huatulco instead, and went to bed planning to sail back to Santa Cruz Bay the next day. However, overnight we both changed our minds yet again. 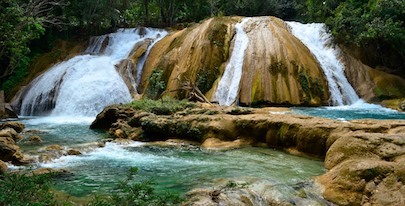 We could easily have stayed in Huatulco forever, but more adventures surely awaited us up ahead. 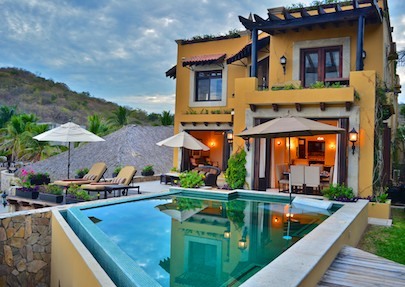 Huatulco – Las Palmas Villas on picturesque Playa Violin – Gorgeous! 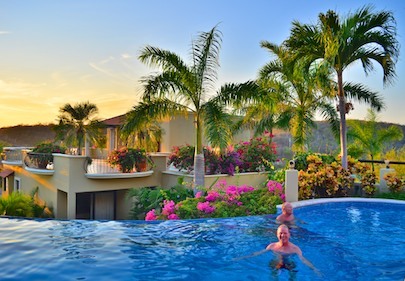 Late January, 2013 – After seeing the beautiful beach house, Villa Escondida at Playa La Bocana, we had the good fortune to spend more time at the dazzling resort of Las Palmas. 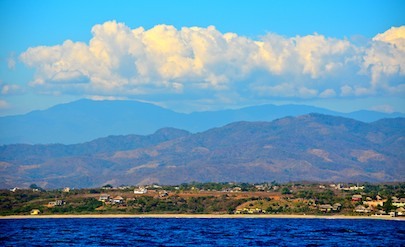 The Gulf of Tehuantepec had gotten into a particularly unpleasant mood lately, and life aboard Groovy at anchor in Santa Cruz Bay had become a struggle to hang on for dear life as we lurched about in the rolling waves. Bruises showed up on our arms and legs in the craziest places, coffee cups went flying periodically, and dishes in the microwave did drunken dances as the carousel spun them around. Groovy was taking us for wild rides – at anchor! Las Palmas – Just Stunning!!! A romantic spot by one of the pools. 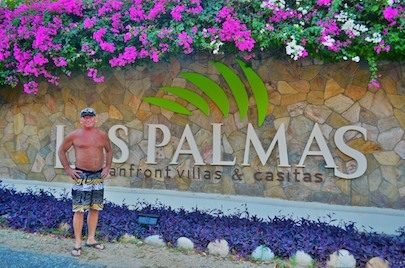 Our new friends at Las Palmas graciously invited us up for a little more time off the boat. What a magnificent place to regain our balance and get our shore legs back! It was truly divine to kick back in a lounge chair poolside. Of course those shore legs took a while to return. Going into small spaces like a showers and bathrooms, everything seemed to spin like a whirligig. 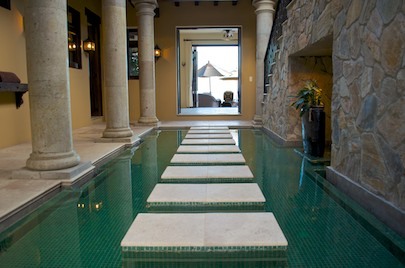 Staggering around the resort, we grabbed doorways and walls so we wouldn’t fall over! 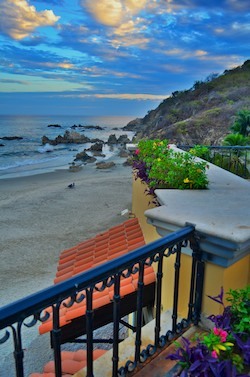 But the world stopped spinning after a little while, and what utterly awesome beauty surrounded us at Las Palmas. It is a place that is made up of one spectacular view after another. Mark and I nearly wore out our cameras, because we could barely take a step anywhere without seeing yet another image that knocked our socks off. The owner, Ron, signs his emails, “The President of Paradise,” and it’s the perfect title. High up on a hill, surrounded by lovingly nurtured palm trees and tropical flowers, with majestic views all around, it really is paradise. 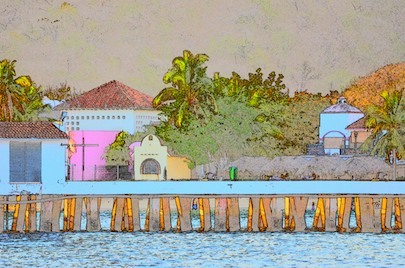 A “color sketch” image I created on my camera from a photo of one of the casita doorways had an almost Mediterranean look. 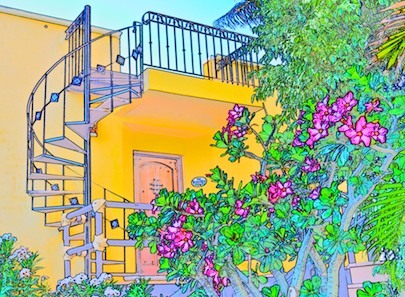 Nikon’s “color sketch” gives it a Mediterranean look. But the climate here isn’t Mediterranean. It’s hot hot hot, and frequent dips in the pool are a must (oh, darn!). 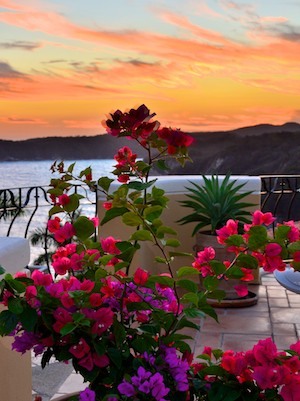 Sunset lights up some flowers on a roof deck. As sunset fell one evening, Ron led us up onto one of the many rooftop terraces. The climate keeps you jumping in the pool… what a shame! We stood there with a group of other guests and watched the most dramatic sunset unfold before us. Down in the bay aboard Groovy we had been missing the sunsets because a row of tall hills blocked much of the western horizon. Up here, however, nothing was blocking anything, and we stood in a row in our bare feet and wet bathing suits, gawking at nature’s incredible colors. Life at Las Palmas is pretty relaxed. 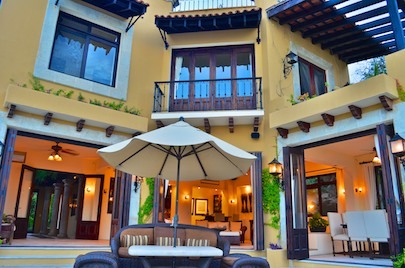 Almost every room of every house opens onto a balcony or terrace or large deck, and you wander deliciously from indoors to outdoors, from living room to swimming pool, from kitchen to pool bar without taking more than a few steps. 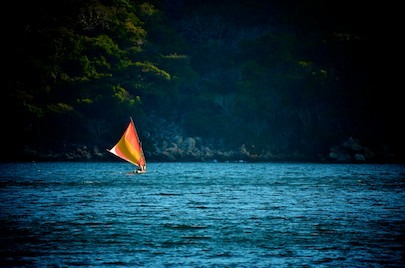 A rowboat on windswept Barra de la Cruz. 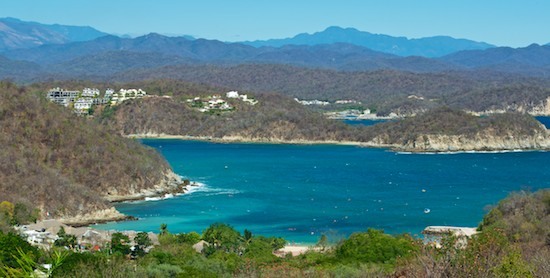 The views sweep both eastward towards town and westward towards Huatulco’s outer bays, depending on where you stand. 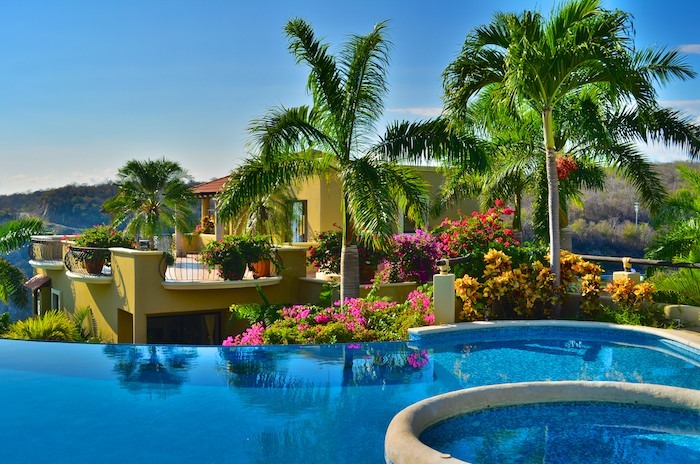 And every part of the resort is easily accessed by short paths and a few stairs here and there, making you feel like the whole property is your own personal estate. 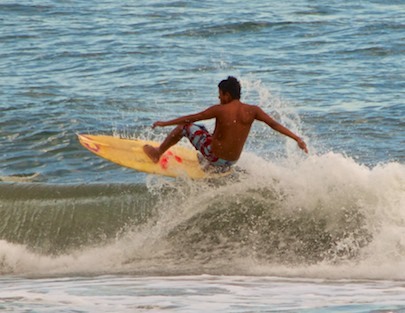 One afternoon Ron took us on a road trip out to Barra de la Cruz, a long, windswept beach that is a local favorite for surfing. We had thought the surf would be up, because a Tehuantepecker was still blowing ferociously, but the waves were actually small and confused that day. 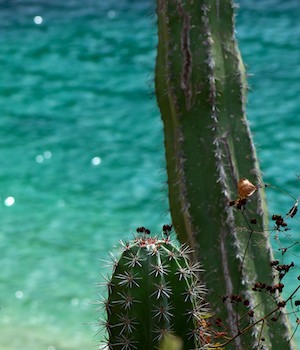 Cactus are friends with the ocean all along Mexico’s Pacific coast. 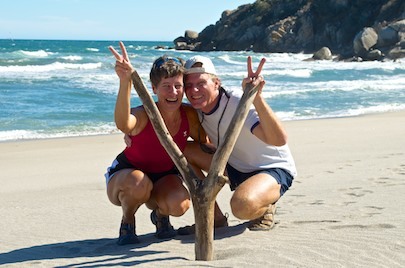 However, the beach was lovely to stroll on, and we had fun posing and playing with a few props we found along the way. Playa Violin – clear and inviting. Back at Las Palmas, we took a morning walk one day down to Playa Violin, the beach that fills the majority of the views from the resort’s hilltop spot. The path in the woods peaks out at the beach here and there. Craggy rocks line the shores of Playa Violin. The surprising thing about all of Mexico’s Pacific coast is that cactus grows everywhere. Cactus and the ocean don’t seem like they’d be close companions, but very often they are. A corner of the beach at Playa VIolin. The water was particularly blue and clear that morning, so we rushed down to the beach with snorkeling gear to see who we could meet up with in the ocean. Fish swim just below the surface. Playa Violin is small beach tucked into the end of a narrow cove that is hugged on each side by steep cliffs. It would be an ideal anchorage, except these rock walls extend out into the water, crowding out the little bit of sand that is in the middle of the bay, and robbing boats of any possible swing room at anchor. 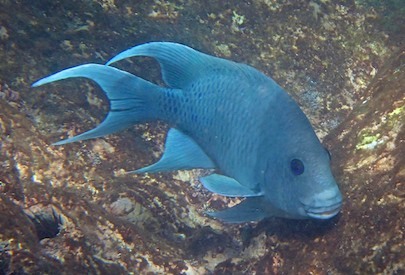 The rocks form wonderful canyons underwater, however, and the fish are plentiful. 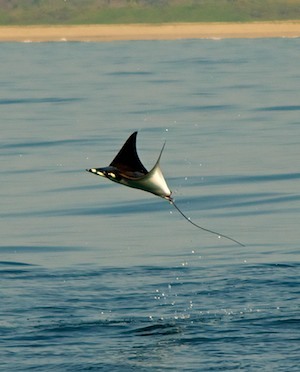 We didn’t see any exotic big guys like rays or turtles, but the huge schools of small fish were abundant. Some wildflowers lured Mark off the path. 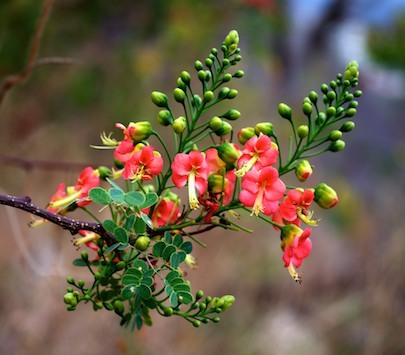 Nearby we found some beautiful flowers in bloom. 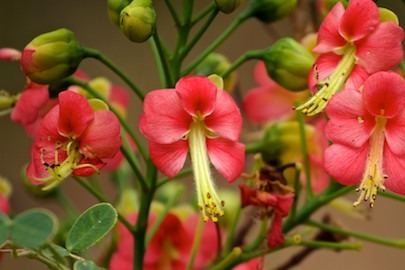 Of course, Mark loves taking wildflower photos, so he was delighted to discover a few exotic ones he didn’t recognize and then he saw the familiar Regina which we first learned about at the beautiful orchards of Hagia Sofia. 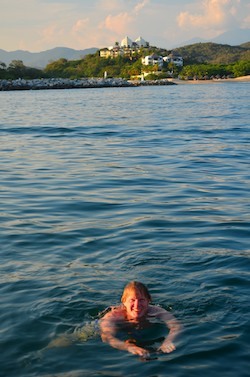 When we first arrived in Huatulco the day after Halloween, we thought we might stay a few weeks. But this is a place that grabs your heart and doesn’t let go. We had heard a saying from some of our local friends that if you eat iguana in Huatulco you will never leave. Well, we hadn’t tried iguana yet, but it didn’t seem to matter. Leaving was something we just didn’t want to do!! 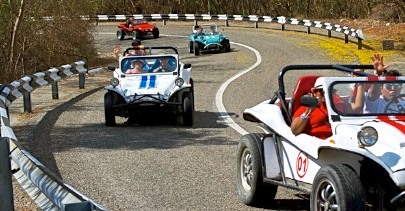 Huatulco on Wheels – The fun and funny vehicles of Huatulco Mexico! A group of motorcycles rides through town and ends up on the beach. 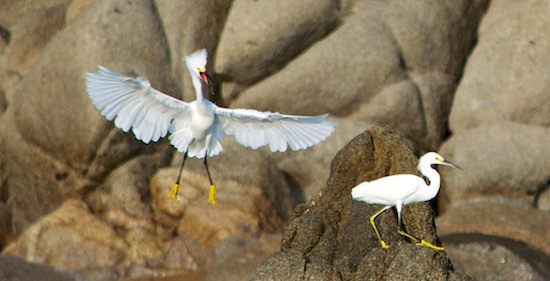 Mid-January, 2013 – Huatulco’s underwater world is truly glorious, with exotic aquatic creatures wriggling, swimming and soaring about. But the above water world is full of land animals with equally unusual modes of transportation. 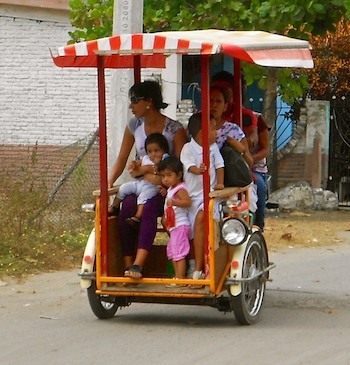 Ever since we arrived in Huatulco two months ago, we’ve been keeping tabs on all the crazy rolling contraptions we see around town. 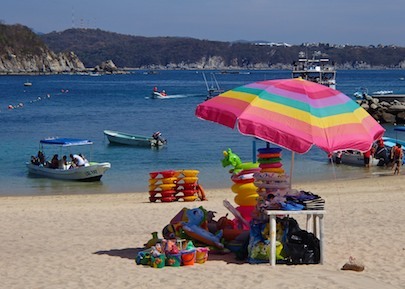 The climate in Huatulco is sultry and hot (a winter “cold snap” dropped the mid-day highs down to 85 F for a few January days, but it didn’t last long!). So most folks like to buzz around town in something breezy. A group of motorcyclists showed up at the beach Playa Entrega one day in black leathers, bandanas and tattoos. While we sat at the table next to them in the sand, we were impressed by the steady stream of ice-filled Corona buckets that arrived at their table all afternoon. Other than speaking Spanish, this happy crowd was just like their Harley brothers up north! Two-up on a scooter with surf boards! But big bikes are actually in a minority in Huatulco, as scooters and small motorized bikes are easier to maneuver on the narrow roads. 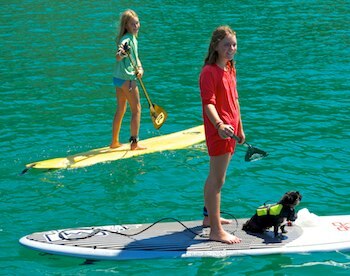 People often ride them two-up, and we saw one pair toting surf boards too. 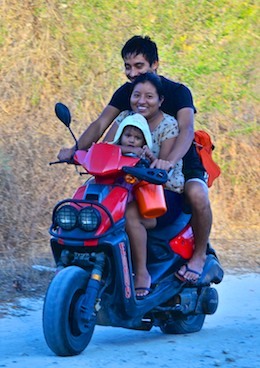 Sometimes these scooters function as the family car, and it’s not uncommon to see Mom, Dad and a kid or two zooming past together. There are those who prefer traveling at slower speeds while getting some exercise, and they pedal around town on all types of bicycles. 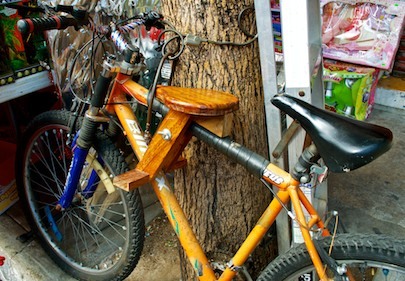 One of the coolest bikes we saw had a special wooden passenger seat mounted on the top tube. Very clever! 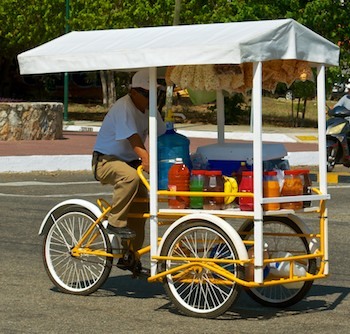 Lots of snack vendors like to peddle their wares by pedaling a trike with all the goodies laid out in front of the driver. You can either flag them down as they ride by, or catch up with them later when they set up shop under the shade of a tree. 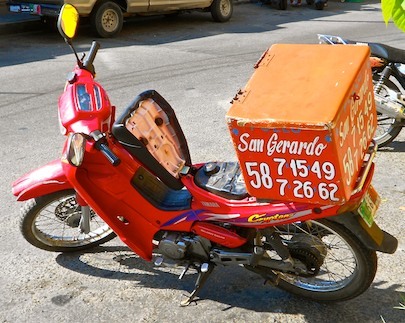 Even “pollo asado” (grilled chicken) and pizza delivery are done on two wheels in these parts. The pizzas or chicken dinners are loaded into a big box on the back of the scooter and then buzzed out for delivery to homes and hotels. 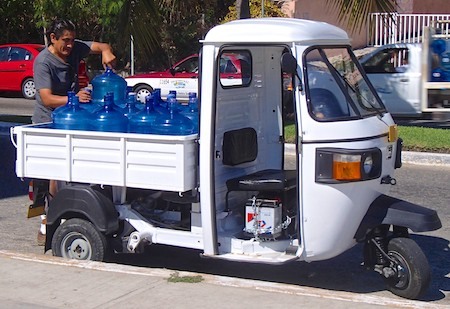 Drinking water is often delivered in big trucks, but there are a few guys around town who use little converted tricycle tuk-tuks instead. This is just too cute!! 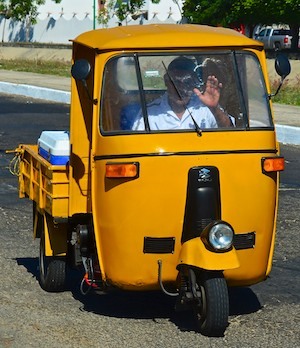 A tuk-tuk can also make a good miniature pickup. Whatever’s getting hauled, if it’s not too huge, a tuk-tuk truck bed is low-slung and makes it easy to load things in and out. 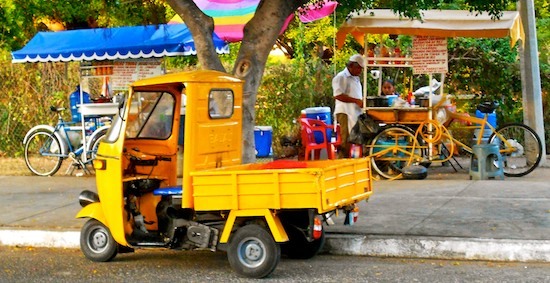 A tuk-tuk parked in front of two snack vendors with their trikes. Some folks simply operate their food service business right out of the back of a regular pickup truck. 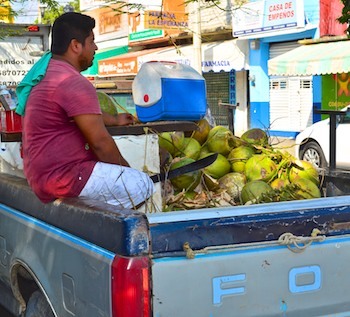 Coconut meat and coconut milk drinks are very popular, and turning a truckload of coconuts into a pocketful of cash is just a matter of sitting there among the fruit, machete in hand, and slicing away as customers stop by. 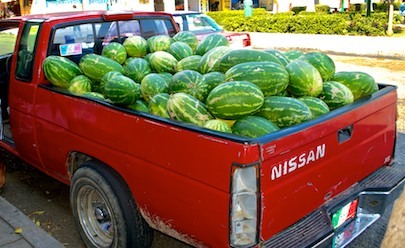 One day while we were standing in front of the row of “fruterías” (fruit stores) in town, a pickup full of watermelons parked in front of us and was soon unloaded onto the store shelves. Talk about fresh fruit! 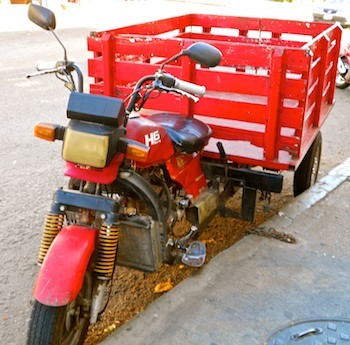 If you’ve gotta haul stuff around town and don’t have a truck, another great option is to convert a motorcycle into a truck of sorts by removing the back wheel and replacing it with a two-wheeled cart. Lots of motorcycles here lose their back ends to practical upgrades like this. Sometimes the motorcycles get to keep their back end in the conversion but lose their front end instead. We passed one fellow who had lopped off the back of a VW bug and replaced it with the back of a motorcycle. Since the VW had originally had its engine in the back, he’d apparently worked out the drive-train issues and was able to drive this gig around. 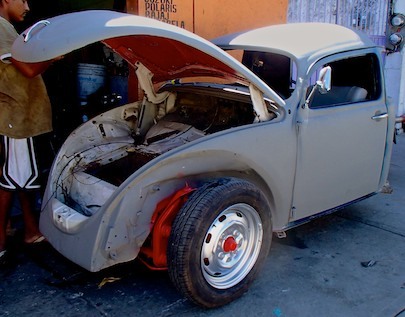 Volkswagons are hugely popular, and they get chopped and cropped and rebuilt in all kinds of wonderful ways. 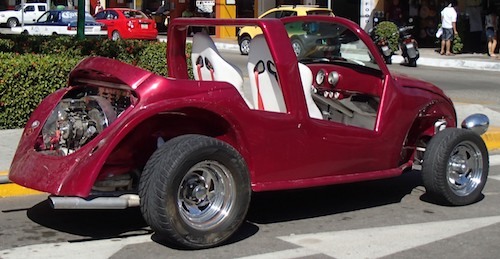 We saw a red one that had been reworked to be something of a dune buggy, or golf cart, or very cute convertible. 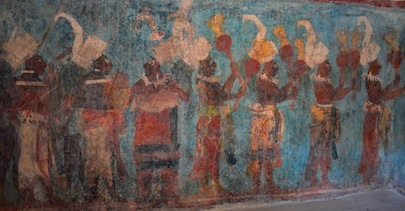 A black one got a similar remake. When it emerged from its overhaul, it no longer had opening doors. We got a kick out of seeing the driver leap over the side into his seat before driving off. 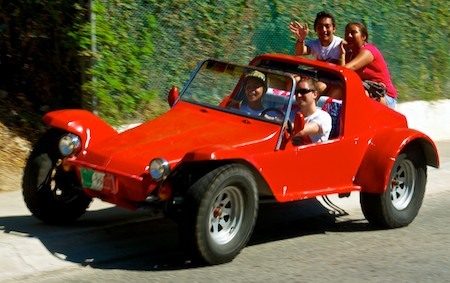 One of the most popular rental vehicles for tourists is little convertible buggies. Every so often one will drive by. And why drive it alone if you can fit four?! Buggies of all kinds zoom around town. But we did a triple-take one day when we looked up the road and saw a whole group of these buggies barreling down a curvy road towards us. What fun! 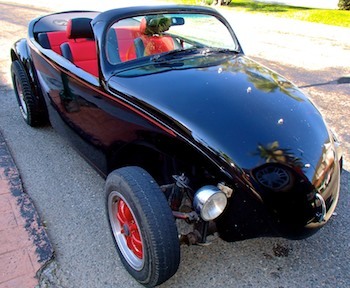 A few lucky people in town have high end roadsters. It sure would be nice to travel in style like that, though you’d want to be sure your bathing suit was dry and you’d brushed the beach sand off your feet before climbing in!! 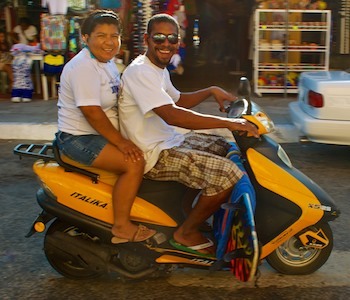 In the end, if you need to get around Huatulco, having any kind of wheels is better than having no wheels at all. And if you don’t have four wheels, and you can’t get your hands on two, just one will do! 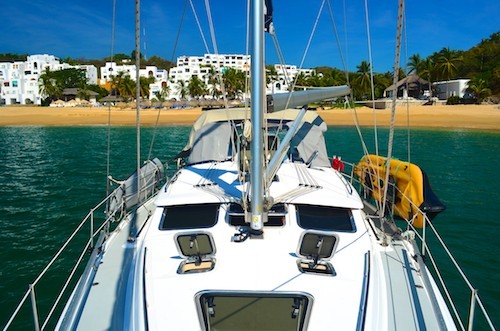 We were getting such a kick out of cruising around the streets of Huatulco, that it came as quite a surprise when we received an invitation that swept us off the streets and back into the land of luxury for a night!! 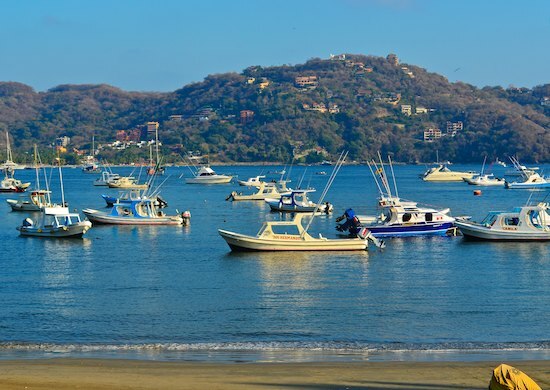 Early January, 2013 – The holiday throngs in Huatulco’s towns and beaches disappeared abruptly on the Monday after New Year’s, and instantly the intimate and dreamy charm of the Bays of Huatulco returned. 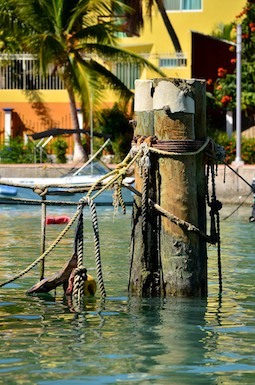 We were back to our very quiet and peaceful days of milling around the bay under the tropical sun. This waterproof camera is cool! 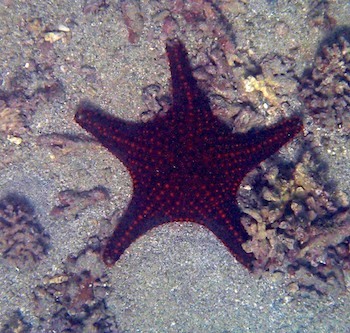 Below the surface of the water, however, newcomers were showing up all the time — or at least they were newcomers to us. We had been doing lots of snorkeling throughout our stay in Huatulco, and we’d checked out the underwater landscapes in several bays. Our new waterproof Olympus Digital Camera TG-820 was a real joy, and we loved playing with it in the water. Groovy’s hull supports a complete ecosystem. Groovy always has a complete ecosystem living on the undersides of the hull, rudder and keel, including stuff that looks like lettuce, gelatinous creatures that look like a thin film of clear jello, tiny crabs and adorable minuscule striped fish. Below them a crowd of larger fish circles eternally, and we hear strange crunching noises all night long. Even when we go out sailing, our little fan club of fish regathers under the hull when we return, grateful for our shade and our smorgasbord of goodies growing on the bottom. 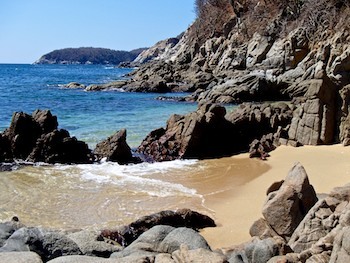 Besides watching our own resident fish, the best place we’ve found for snorkeling in all of the Bays of Huatulco is Playa la Entrega. This fabulous beach is in the main bay of Santa Cruz and seems an unlikely place for such phenomenal snorkeling, given how close it is to the village and harbor. 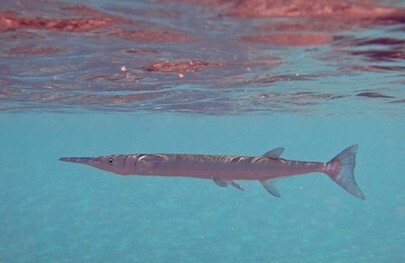 A trumpet fish swims by. 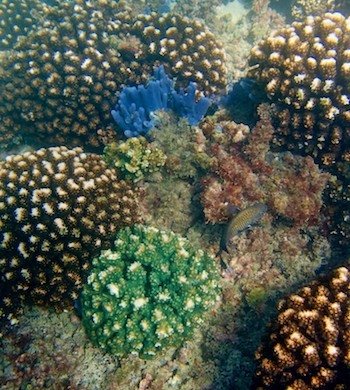 Its huge coral reef is roped off to boat traffic and is filled with canyons and caverns and very tame fish. Crowds of eager snorkelers arrive by tour boat everyday and more crowds come on foot, by taxi or by car from town. So these fish are quite accustomed to flailing fins and bright orange life jackets and kids paddling their arms frantically at the surface. They just move out of the way and keep doing what they do. A fully inflated puffer fish! 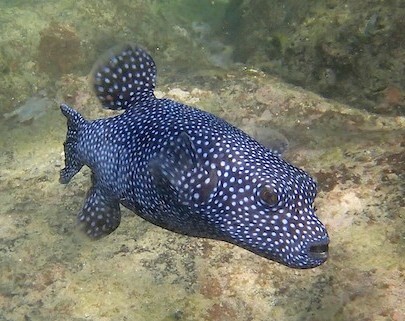 Polka dotted puffer fish are very common, but they are usually deflated to just their normal size. 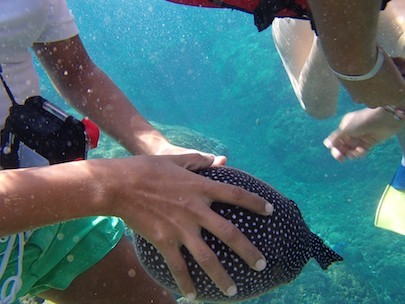 What a surprise it was when another snorkeler held out an inflated puffer fish for everyone around to see. It was like a little football in her hands. These blue guys are everywhere. 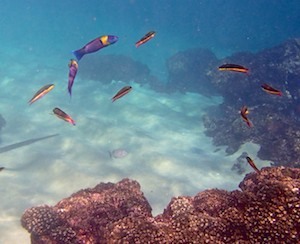 We got a huge kick out of trying to learn to photograph fish underwater. Problem is, they dart around so fast. We have gazillions of photos of swishing fish tails disappearing into the distance. But occasionally we’d get lucky. 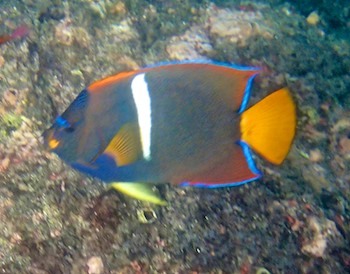 The king angel fish are gloriously colored, with a dark body that is trimmed in an iridescent outline of blue that you can see only when the sun hits it just right. Other fish are trimmed with glitter all over too. 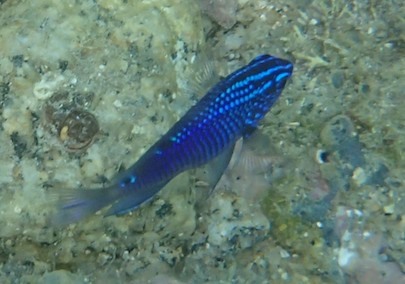 Brilliant, flashing bits of blue, like blue sequins, seem to be a very popular fashion in this underwater world. 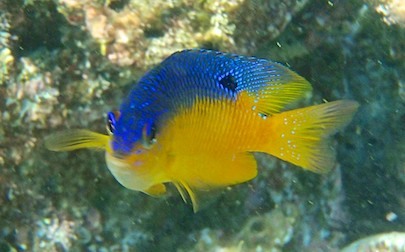 Many of the reef fish are just the size of a fingernail, and they move like lightning! 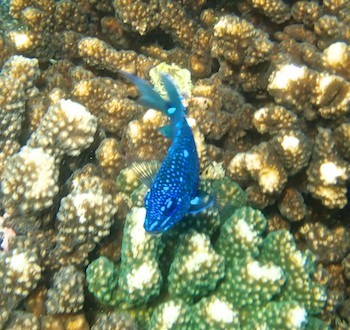 This one sports a blue sequin outfit. 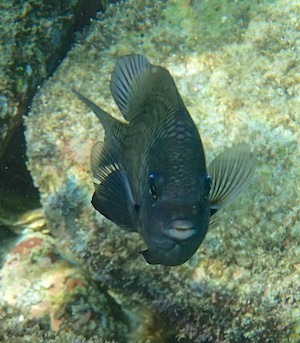 Other very large creatures play in the depths in Huatulco too. 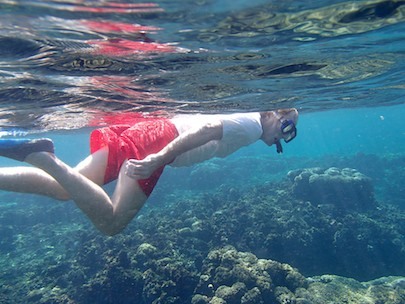 Every so often, while snorkeling along, we’d look up and see the fins and tanks of other people in the water — or we’d suddenly see each other after going in different directions. But being with other people in this amazing pool of aquatic life never marred the experience. A different kind of fish! Sometimes it was more fun to have other people around to share a little in the excitement. We definitely felt like Jacques Cousteau’s explorers from his boat Calypso! 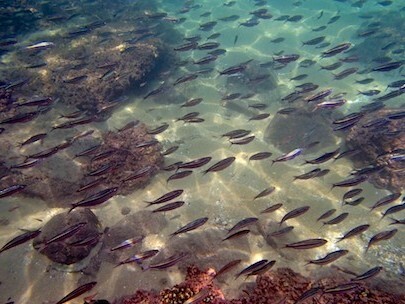 One of the amazing things to me was that many fish seem to prefer to stick together in tight groups. 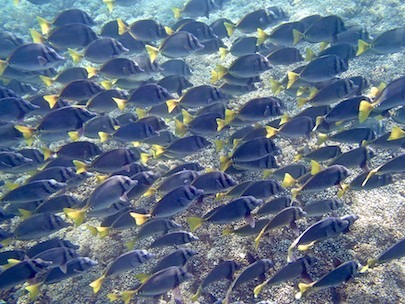 I’d be swimming along, and suddenly a fleet of identical fish would sail by — quietly making their presence known in the ‘hood — kind of like a street gang. They’re going somewhere in a hurry! Sometimes I’d be staring at a few solitary fish swimming around a coral head, watching them pecking at whatever yummy morsels they could find, and then there they’d be: The Gang. They’d saunter by like they owned the place. 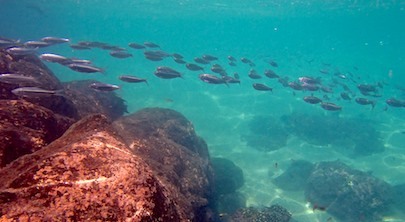 Playa La Entrega is teeming with fish. I noticed the gangs would never intermingle. Each gang would go its own way around each other, and the individual fish never got confused or got caught up with the wrong group. 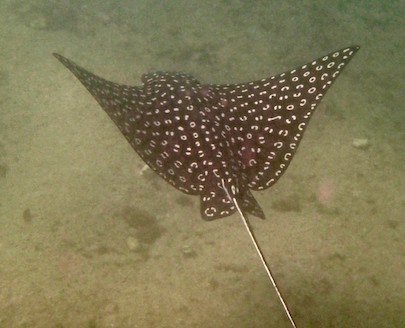 Spotting a spotted eagle ray totally made my day. 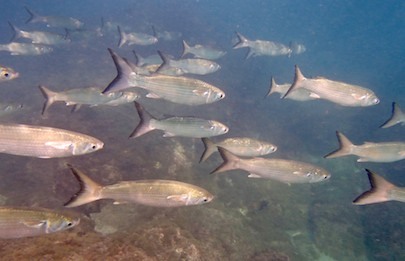 One day while snorkeling near the boat, a school of fish came zooming by us like their tails were on fire. What the heck?! Something was after them! 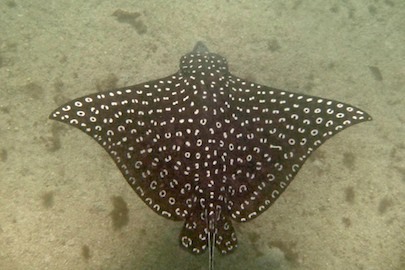 Not too many minutes later we saw an enormous spotted eagle ray soaring along the bottom. This unusual creature was like a bird flying low along the bottom of the sea, sweeping its wings in a gentle but powerful motion. Then I saw a second one. They flew along together for a while and then parted again. I was so grateful to have the waterproof camera with me! 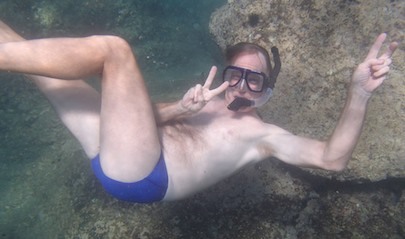 So it was particularly frustrating a few days later when I jumped in the water and discovered the camera had locked up. None of the buttons would work. Mark couldn’t come snorkeling because he had cut his knee badly when he was re-routing some wires in the boat earlier and had inadvertently taken a step back and fallen into an open bilge compartment, skinning his knee terribly in the process. Ouch. I wince now ever thinking about it. Fish lips – wanna kiss?! So he took the camera to see what he could do with it. “This will be the day you see something really awesome!” He chuckled at me as I swam off. I was really bummed not to have him with me and not to have the camera, but the wonderful steep rocks at the end of the point beckoned me, and I hoped I’d have a story or two to share with him later. 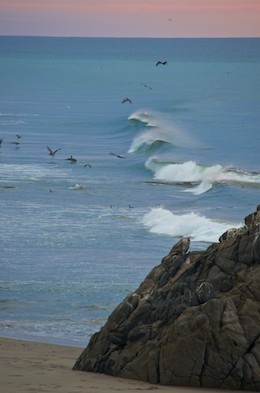 There was lots of wave action out at that point that and tons of tour boats were circling as well. I was excited but a little unnerved as I snorkeled beyond familiar territory. 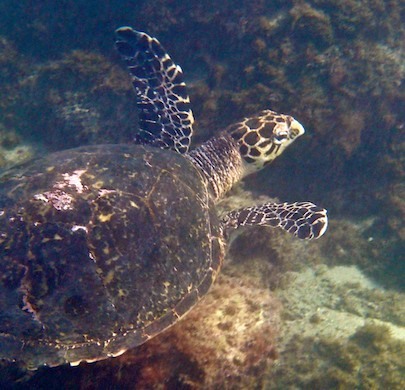 Sea turtles came into our bay – what joy! Then, rounding the last corner, I suddenly found myself nose to nose with a sea turtle. Holy cow! I spluttered and backed up as fast as I could. And so did he! He turned and started to swim out to sea. I couldn’t resist following him a ways. The spray from the breakers made the water foamy white all around me, but every so often I could see his head peaking out of the spray as he swam off. 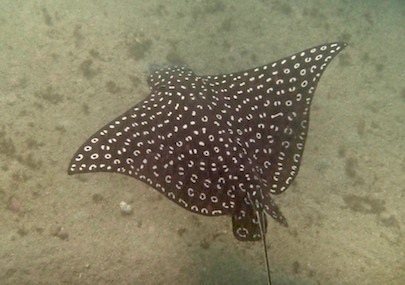 What a cool underwater sighting. 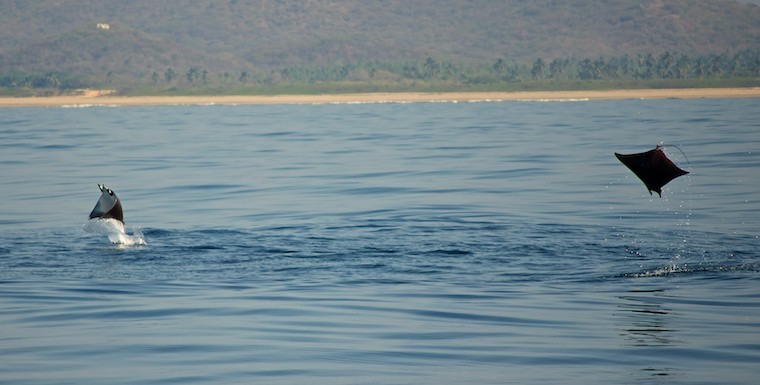 Unfortunately he wanted to go into the middle of the bay, so I turned back, only to see another turtle, right at my side! Holy mackerel! I followed him for a while, thinking, “Isn’t this just the way. Alone, no camera, and two turtle sightings! Wait til I tell Mark!” The turtle swam at leisure, turning his head to look up at me every so often. 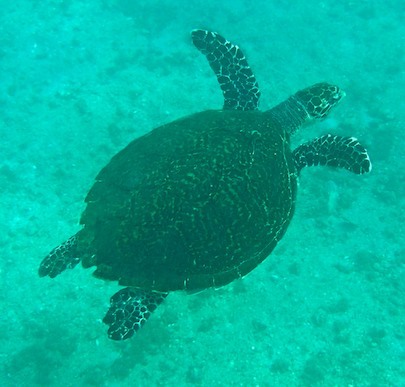 Then he dove down — to join another turtle that was below him nibbling on the anchor chain of our friend’s boat! This was too much!! Imagine these guys swimming with the turtle and getting a snack from his back! I watched them swim with each other for a while and then made a beeline back to our boat, only to bump into a fourth turtle which turned out to be my best turtle sighting yet. This one soared over the coral studded bottom in very shallow water as the sun’s rays played all around him. I could make out the beautiful pattern on his shell and could have easily reached out and touched him. 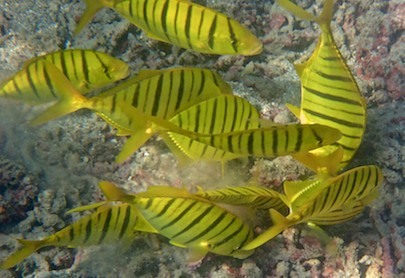 On his back a school of bright yellow fish with tiger stripes nibbled at his shell, catching a ride and a meal to go. We swam together for a glorious five minutes or so, and he never showed any concern about me, the fish on his back or anything else. Just happy to be alive. When I got back to the boat I was beside myself telling Mark my story, wishing he had been there, wishing the camera hadn’t broken, and just talking and talking and bursting with my thrilling news. When I finally quieted down for a minute he said, “Well, you’ll be glad to know I fixed the camera! !” What??!!!! “I got it working just a few minutes after you left. I tried to call you back, but you were too far away….” Ohhhh oh oh oh oh!!! 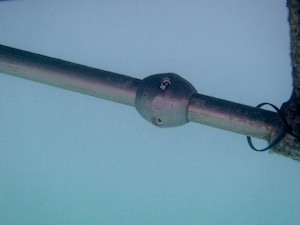 I found out that night that even though we had rinsed the camera thoroughly after each underwater use, the zoom button had gotten gummed up from a buildup of salt. The camera was stuck in “zoom” mode and was too busy zooming to respond to any other buttons. 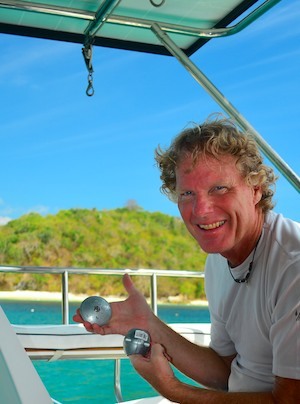 Mark sprayed the zoom button with “Salt Terminator,” a product we use to flush the salt out of our outboard engine before storing it. Experimenting over the next few days, we found that the zoom felt a little sticky if we only rinsed it with fresh water, but if we used the Salt Terminator or even a little dishwashing soap, it came out sparkling clean and the zoom button retracted smoothly, as it was supposed to.